Both Peg and I were born and raised in New York State. Although we were raised in very different regions of the state, we know NY state very well. From the highlands of Western New York, to the wine country of the Finger Lakes, to the ancient forests of the Adirondacks and the peneplain of the Catskills, and to Long Island Sound, the state is a wonderland of natural beauties, if not political common sense. The Hudson River Valley was our home for more than 25 years. It was a wonderful place to live, work and raise our children. The Hudson River is an extraordinary natural wonderland. We loved New York State. But, we are “country mice,” not “city mice.” This monograph is offered from these perspectives. 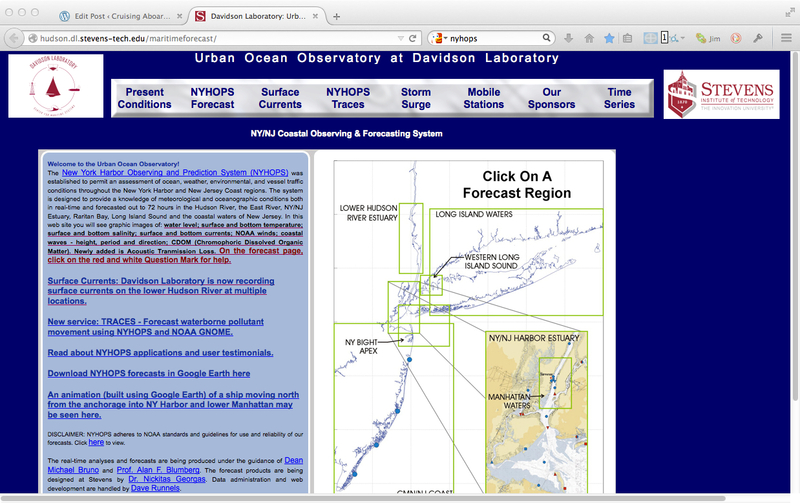 Northbound from New Jersey, cruisers should consult the website of the Urban Ocean Observatory of the Davidson Laboratory at the Maritime College of Stevens Institute. This site offers a very complete and robust mathmetical model of the ocean and estuary systems from the Delaware Bay to Rhode Island Sound, including the New York Bight and the Hudson River Estuary. The section of the website that shows “Surface Currents” will be invaluable to helping cruisers manage transit times around ebb and flood currents on the coastal Atlantic shelf off New Jersey, and transits of the Hudson River, East River, Harlem River and Long Island Sound. Here is the site link: here: http://hudson.dl.stevens-tech.edu/maritimeforecast/traces/. Tidal currents in NY Harbor and the Hudson River can run to 2 – 3 kts. In addition to tidal currents, the Hudson River watershed produces a substantial south-flowing current in it’s own right. The result is that the strength and period of ebb exceeds that of flood. Ebb will be 1/2 to 1 kt stronger, and usually runs 7 to 7-1/2 hours while flood runs for 5 hours or less. Plan accordingly; modestly-powered boats heading northbound against the ebb will find progress to be slow and tedious. The Stevens Institute website can help cruisers locate and run in northbound eddies even when the river is ebbing. These eddies can be of substantial help if one MUST run north against the ebb. Be alert for large flotsam in the river, particularly in the early spring and after periods of heavy rainfall in the upper-Hudson watershed. 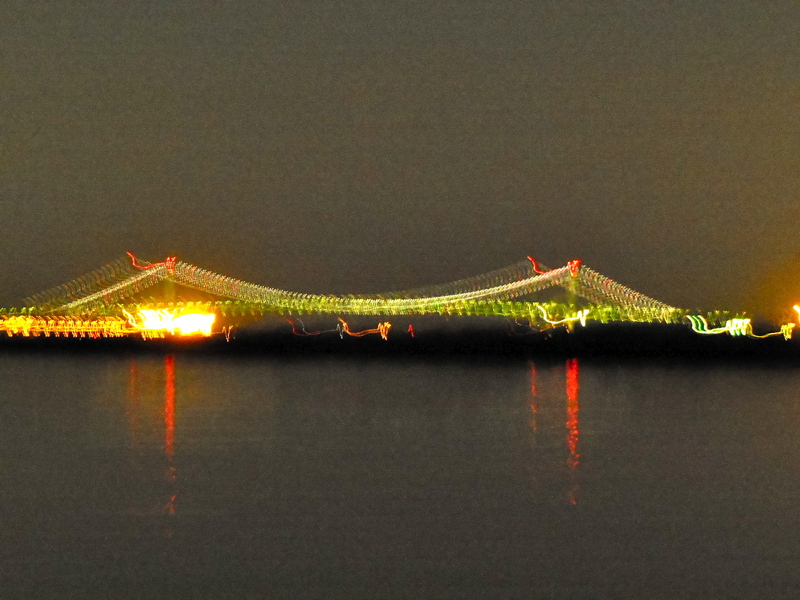 Northbound from New Jersey, all cruisers – regardless of boat speed and design – must travel offshore in the Atlantic Ocean from at least New Jersey’s Manasquan Inlet to the New York’s Verrazano Narrows. 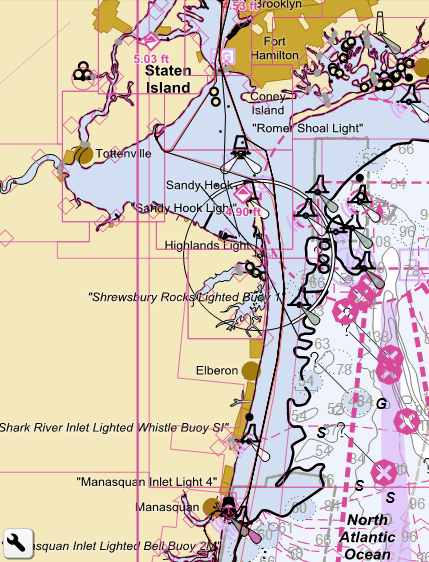 This route rounds the major New Jersey land feature, Sandy Hook, and continues northeasterly across Raritan Bay to New York. The route crosses the ship entrance to New York Harbor (the “Ambrose Channel”). In these waters, smart pleasure boat operators can safely and easily operate outside of marked channels, staying well clear of commercial traffic. It’s an area where commercial traffic and day fishermen are visible at significant distance. It’s also an area where ocean-going ships operate at speed, so there can be significant bow and stern wakes from those behemoths for those too close to their channels. These waters require careful watch-standing, but visibility is 360° and transit will not be any more challenging than any other busy harbor waters on the US East Coast. “New York Harbor” is comprised of two bays: the “Lower Bay” and the “Upper Bay.” The Verrazano Narrows (“The Narrows”) is the divide between Staten Island and Long Island, and is the demarcation between the Lower Bay and the Upper Bay. The waters south the “Narrows” and north of a line from the southern tip of Staten Island to Coney Island, Brooklyn, are known and charted as the “Lower Bay.” Except for Gravesend Bay, where there is a good pleasure craft anchorage, the Lower Bay is largely open water. The impact of tidal currents is less in the Lower Bay than north of the narrows. The most important “hazards” to pleasure craft in the Lower Bay arise from Day Boat traffic and Fast Cat ferries that operate between Atlantic Highlands and the East River ferry terminal. 4. continue northbound to and through “The Narrows” to stay at either Jersey City, NJ, or in NYC. Great Kills Harbor on Staten Island is a well protected harbor with several marina facilities. Sanctuary and crew have enjoyed the hospitality of the friendly and welcoming folks at Great Kills Yacht Club. GKYC has a special rate for members of America’s Great Loop Cruisers Association (AGLCA), and will accept other transients on a space-available basis. From GKYC, there are convenient bus connections into New York for those planning to visit the city. Great Kills is an excellent place to ride out heavy weather. 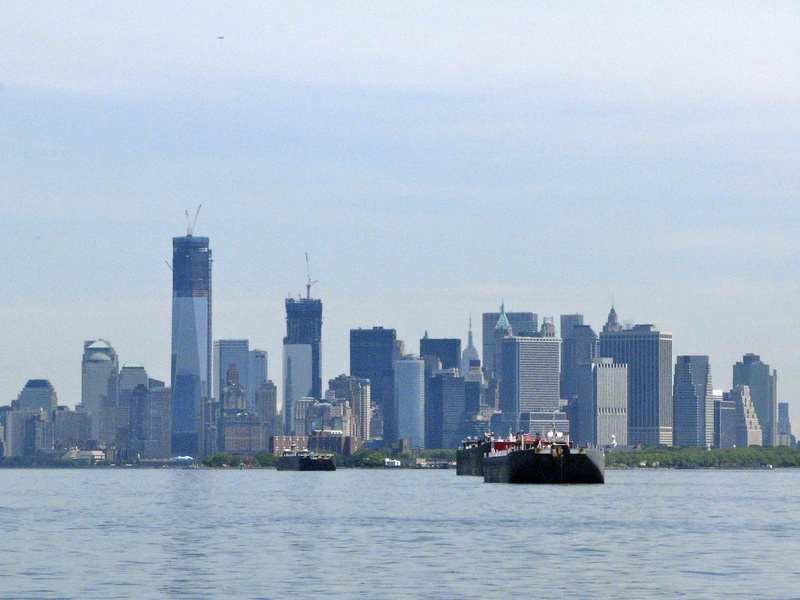 New York harbor is one of the largest and busiest seaports in the world. For visitors, especially first-time visitors, navigating the Upper Bay of New York Harbor is a special case by any comparative standard; very large harbor size, very complex locale, multiplicity of connecting river and creek systems, swift tidal currents, large variety and speed variations of commercial traffic, abundant official traffic from many agencies, variety of pleasure craft (very large to very small), charter traffic (sight-seeing and tour boat), occasional large flotsam in the water, several security zones, multitude of local knowledge place names, and more. The entire area north of the Narrows, from the Verrazano Narrows Bridge to the Battery of lower Manhattan, is the “Upper Bay” of New York Harbor. The Upper Bay is more narrow and very much busier than the Lower Bay, with a wider variety of navigational challenges and watercraft. Staying out of marked channels is highly advisable and not always clear to those unfamiliar with these waters. The Upper Bay has commercial facilities, docks and commercial traffic literally 360º from almost any point along the through north-south route. In the south-center of the Upper Bay basin, there is a very large commercial anchorage for ships and large ocean-going barges. The area can be busy with working tugs. From a line between the Statue of Liberty and Governor’s Island north to the W. 70s of Manhattan, ferry traffic and water taxis rule. The professional captains of these vessels operate on schedules, know where they’re going and are not impressed or distracted by the skyline of NYC or the figure and form of the Statue of Liberty. Cruisers MUST be alert to these vessels, which approach quickly, from every direction, and often turn abruptly to proceed across the bow of slower vessels. In general in the Upper Bay, it has been our experience that there is less commercial maritime traffic, and especially less tug, tow and large ship traffic, on the eastern shore of the harbor (Brooklyn shore) from “The Narrows” north to Governor’s Island, then across the mouth of the East River approaching lower Manhattan. That is our preferred route through the harbor. After we round the battery into the Hudson River, we favor the eastern shore, but stay 1000 feet or so offshore. That gives water taxis space to maneuver around us without our “being in their way.” We try to time our passages through the Upper Bay and lower Hudson River to be between the hours of 10h00 and 15h00. Sundays have the least water taxi traffic, but generally during mid-day hours, water taxi traffic is “minimized.” There are very high speed catamaran ferries that come to lower Manhattan from Atlantic Highlands, NJ, so MAKE SURE TO KEEP WATCH BEHIND YOU. These fast ferries can appear in remarkably short time, and they throw large wakes for which cruisers will want to be prepared. Those planning to transit the East River to Long Island Sound must consider the state of the tide and tidal currents. The currents in the East River, particularly between Roosevelt Island and Hell Gate, run to 8 knots or more at ebb and flood. It’s way safer to have that current with you than against you; especially for us, as we are only a 7.5 kt boat to begin with. Second, in the day or two preceding your planned passage, make certain there are no heads-of-state visiting the UN. For some, including the President of the United States, the Coast Guard will close the river to all traffic. For lesser dignitaries, the main channel will be closed, forcing pleasure craft and through commercial traffic to use the alternative channel. That channel is fine, but slightly more of a pilotage challenge in swift current conditions. If the East River is closed, there is an alternative route to Long Island Sound, around the north end of Manhattan, via the Harlem River. 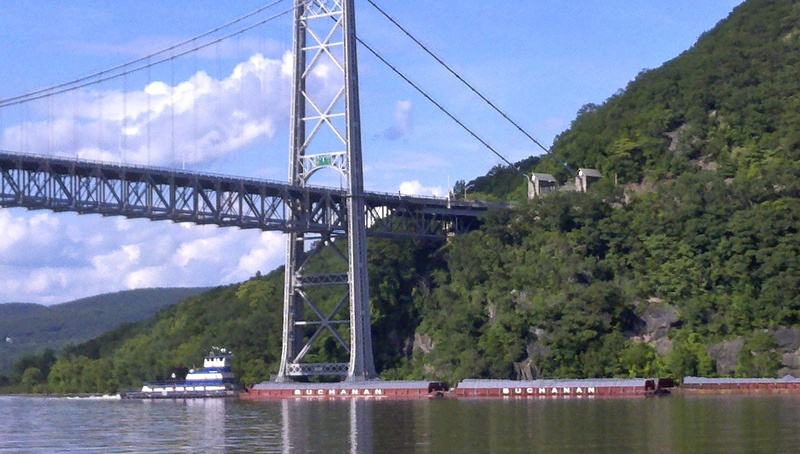 Pilotage is no problem, but there is a complex of road and railroad bridges across the western mouth of the Harlem River (called “Spuyten Duyvil” on charts). The bridges are remotely operated based on train traffic. Delays can be significant and train traffic varies throughout the day. Obtain current local knowledge for the Spuyten Duyvil if planning to use this route. Aboard Sanctuary, we do not find AIS and RADAR to be useful in NY Harbor or adjacent waterways. In the case of AIS, there are simply too many targets to be helpful. Proximity alarms are useless. Water taxis and other vessels that might actually represent a navigation hazard do not carry AIS transponders. We turn our AIS off because it’s more of a distraction than a help. 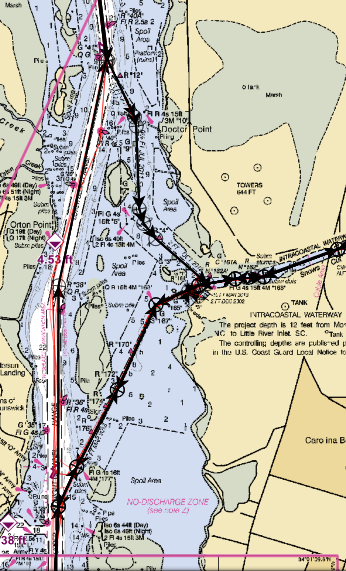 DO NOT TRY TO NAVIGATE NY HARBOR FOR THE FIRST TIME IN THE DARK OR IN POOR VISIBILITY! THAT WOULD BE AN INVITATION TO ANXIETY AND UNWANTED ENCOUNTERS OF THE PHYSICAL KIND. THERE WILL BE WAKES! Aboard Sanctuary, we always monitor BOTH VHF Ch. 16 and VHF Ch. 13. The commercial chatter will be mostly “obscure” in NY Harbor unless one is familiar with local landmarks (“the narrows,” “the gate,” “the Kill,” “the race”). DO NOT WASTE TIME CALLING COMMERCIAL VESSELS; THEY WILL NOT ANSWER! JUST LOOK OUT THE WINDOWS, MAINTAIN A VIGILANT VISUAL WATCH, AND BE PREPARED AT ALL TIMES TO YIELD. Within the Upper Bay, both the New Jersey and New York shores have marina facilities. Marinas in this region are expensive. All marina facilities in the Upper Bay and lower Hudson are exposed to large wakes, particularly during the daytime hours. So, then, what do we do? Sanctuary and crew typically depart Manasquan Inlet and proceed north offshore, to and through the Narrows, and into the anchorage at Liberty Landing State Park, behind the Statue of Liberty (N 40.69617 W -74.06443). That transit is a distance of 45 StM. There, we anchor in peace and quiet. The LLSP anchorage is mostly a fair-weather anchorage, exposed to the south and east, and with only mediocre holding in soft silt. Water depths at LLSP range from 5’ to 12’ at MLLW. There is room for 4 – 6 boats. There are few wakes. 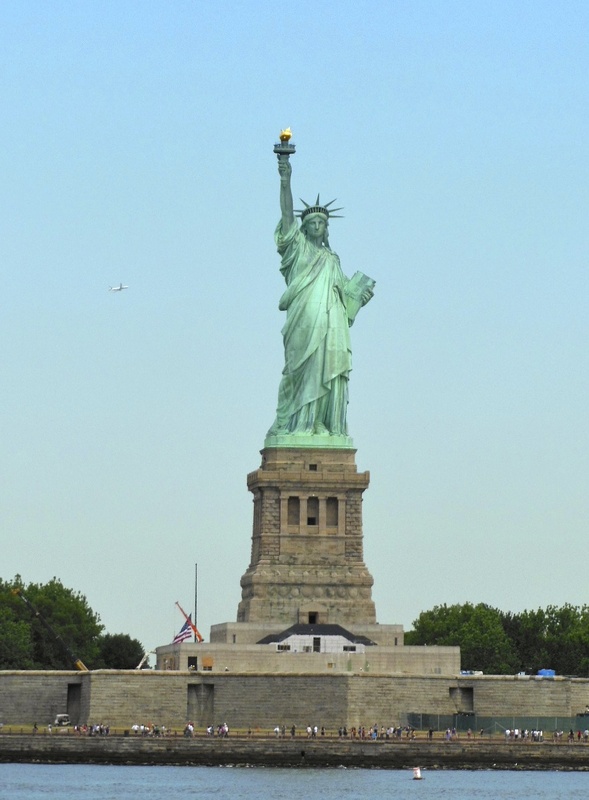 In truly fair weather conditions, cruisers can anchor in the Upper Bay in a large, charted anchorage off the Statue of Liberty. The night-time “city-scape” vista from here is truly spectacular. However, this anchorage is exposed to ever-present large wakes from water taxis, ferries and other commercial traffic, so is not for those prone to motion sickness. LLSP is a great staging point from which to run North up the Hudson River or East out the East River towards Long Island Sound. Cruising authors Alan and Susan McKibben, who’s book we like and recommend, use a Statute Mile reference system which they credit to an earlier cruising guide author, Arthur G. Adams. In this system, New York’s famous 42nd Street is “Hudson River mile zero.” In this monograph, I have adopted that same mileage reference system. 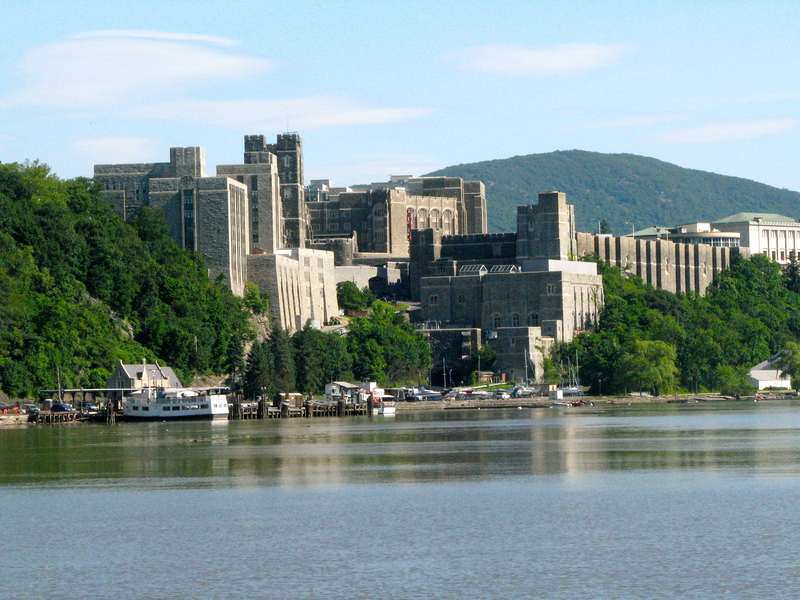 Above Bear Mountain is the stretch of the Hudson that is home to the United States Military Academy at West Point (mile 47.0). There is a marina there which we understand is available for retired or active duty military, but there are no marinas in that area for the cruising public. North, between West Point and the city of Newburgh, NY, on the East shore, is Pollepel Island. 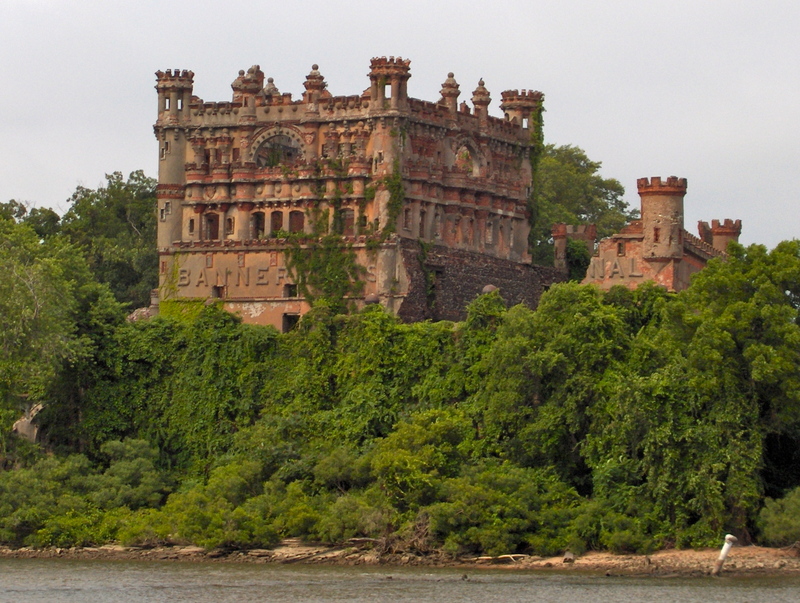 This private island is home to “Bannerman’s Castle.” The island is closed to the public. The “castle” is in ruin and is definitely unsafe. There is a peaceful and scenic fair weather anchorage between the island and the eastern shore (mile 53.0). Enter the anchorage from the south via the correctly charted deep water channel that is very near the shore. Holding is good in depths of 8′ – 12′. Swing room is adequate, and there is room for several boats. There are heavily trafficked passenger railroad tracks along the entire length of the East shore of the Hudson. There will be some train noise in this anchorage. 3. visit the Franklin D. Roosevelt home and Presidential Library and the Vanderbilt Mansion at nearby Hyde Park, NY. These venues are not accessible from the water, so a car is necessary. The city of Kingston, NY, was the first capitol of New York State. The original “Senate House” is located in the “uptown” historic “Stockade District.” Visit Kingston via the Rondout Creek (mile 86.3). 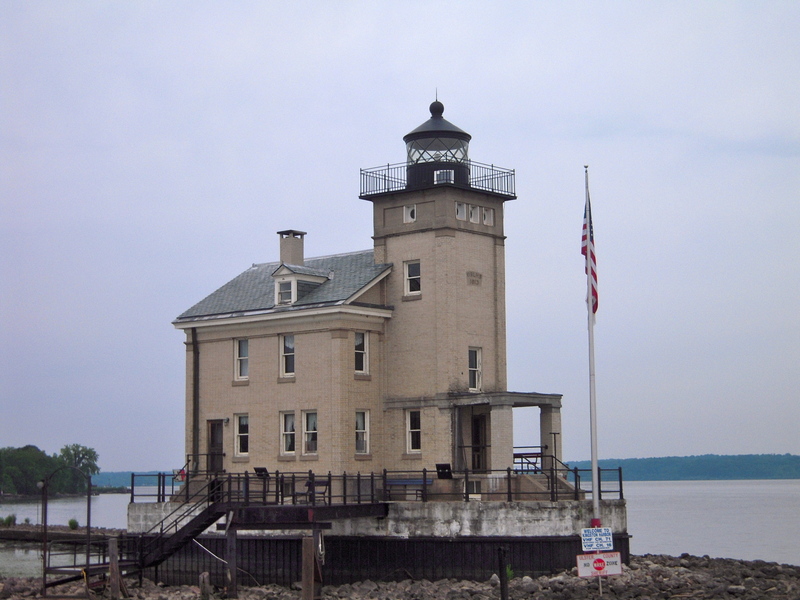 The entrance to Rondout Creek is marked by the Rondout Lighthouse. Follow the well marked entrance channel. There are two marinas in the Rondout Creek that cater to transients. These facilities have different pros and cons. The Rondout Yacht Basin is a full service marina facility. RYB has gasoline and diesel fuel, pump out, pool, floating docks and all of the normally expected marina amenities. When entering the inside basin there, mind the current in the Rondout Creek, which will try to sweep the unsuspecting cruiser sideways in the basin entrance. The other dockage facility in the Rondout Creek is the Kingston City Dock. The City Dock has short floating finger piers. There are heads and modern, clean showers, but no laundry and no wi-fi. There is no fuel or pump out. 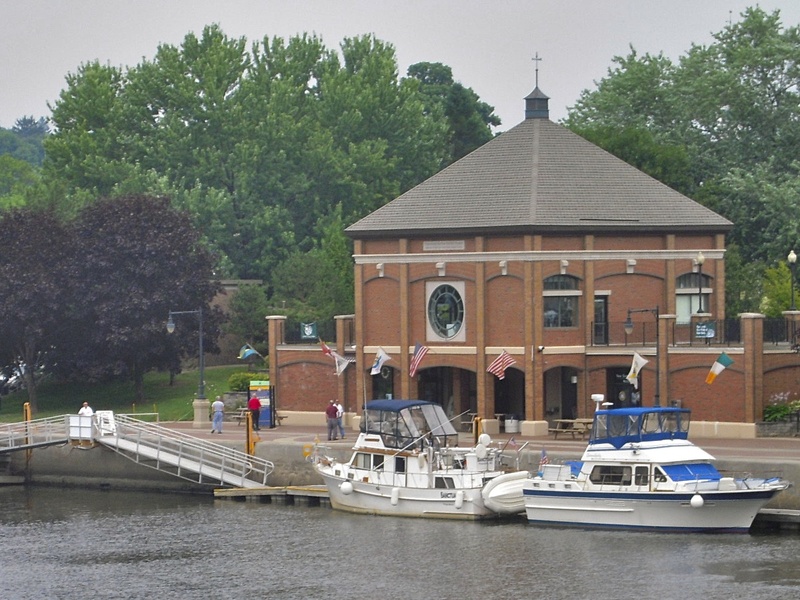 The City Dock has the significant advantage of being located within the downtown Rondout Historic District of Kingston. From these docks, it’s an easy walk to several excellent restaurants, gift shoppes, a wine store and the small but unique Hudson River Maritime Museum. 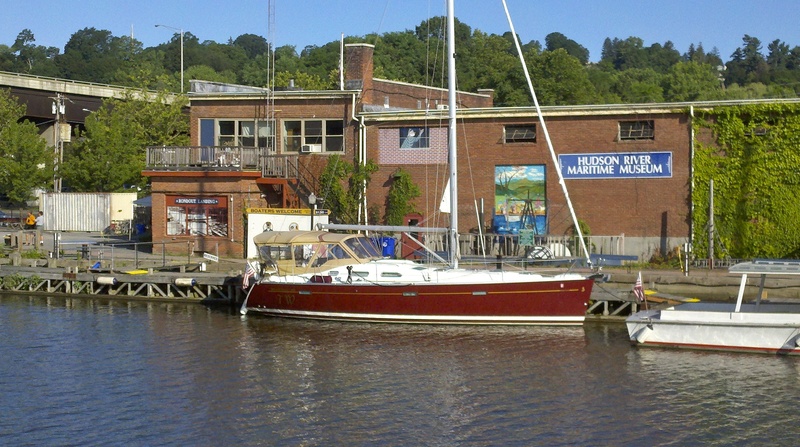 The Rondout Yacht Basin is located across the Rondout Creek and 1/2 mile upstream, on the East shore. Access to the Historic District from RYB requires a dinghy ride, a taxi/car, or bicycles. Very hardy cyclists can bike to the Historic District. The bike ride is at least 1-1/2 miles, and involves significant hills. All things considered, we personally prefer the City Docks for their convenience and location in the Historic District. Upon departure from Kingston, northbound, Sanctuary and crew run to Waterford, NY. Waterford is the gateway village to the NYS Canal System. There are marinas along the Hudson, at Catskill, NY (mile 107.2), Athens, NY (mile 111.2), Coeyman’s Landing, NY (mile 127.5), and Albany, NY (mile 139.5). 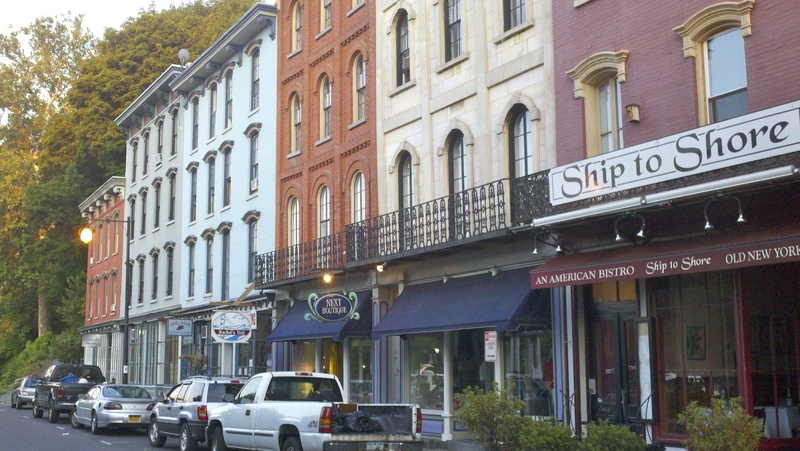 All of the communities of the mid-Hudson Valley are 19th Century working villages. In general, we don’t stop after Kingston until we get to Waterford. Albany is NY’s capitol city. We’ve seen it. The Port of Albany is not difficult for cruiser’s to transit. The Albany Yacht Club (mile 139.4) in downtown Albany has a deserved good reputation, with floating docks and a small ships store. It is within walking distance of local pub food and pizza sources. Ground transportation would be needed to get to grocery shopping. Above Albany, cruisers pass through the “Federal Lock” at Troy (mile 147.7). That lock gets it’s moniker because it is operated by the US Army Corps of Engineers rather than the NYS Canal Corporation (“feds;” get it?). That lock and dam stops the tide level variations on the Hudson. Once north of the Federal Lock, cruisers are in the NYS Canal System. At Waterford, the route divides; one goes North to and through Lake Champlain, the other goes West towards the Mohawk Valley on the historic Erie Canal. 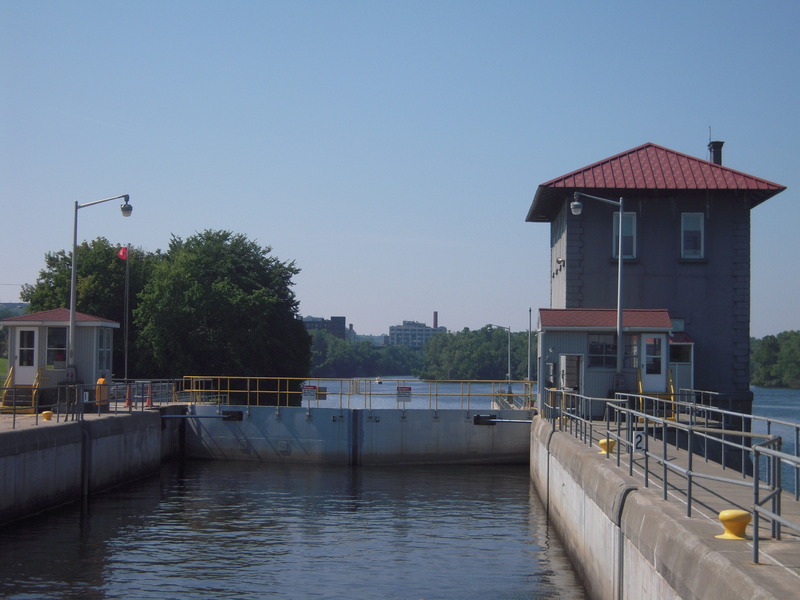 Waterford, NY, is a great stop for cruising visitors, with free, first-come, first served, floating docks with 30A and 50A power and water, and serviceable if crude heads and showers. Some years, the NYS Canal System length-of-stay limit (48 hours) is enforced, and other years, not. Check with the friendly folks at the Visitor’s Center. There is also a high wall at Waterford that can be used for alongside dockage. Shore access on that wall may require substantial agility depending on the design and free-board of the boat involved. Immediately West of the Visitor’s Center is the “flight” of five locks that mark the beginning of the Erie Canal and the transition from the Hudson to the Mohawk River. The headwaters of the Hudson River follow the Champlain Canal north to Lock C7, and then the river wanders off to the NW into the Adirondack Park to wilderness venues like North Creek and Newcomb, where it becomes a magnificent, pristine mountain creek instead of just a magnificent, deep-water river-estuary. The transit from the New Jersey Palisades north through the Catskills to Albany and again north to and through Lake Champlain is every bit as beautiful as the Georgian Bay region of Canada or the Grand Canyon of the Tennessee. Do not rush this area thinking better things are ahead. That would be a great under-estimation of what this region has to offer! This entry was posted in Hudson River on 2014/05/22 by gilwellbear. Roanoke Inlet carried ship draft depths in the 18th Century, enabling a robust shipping trade at Edenton. Not very many cruising boats visit Edenton, NC. We presume the size and reputation of the Albemarle Sound is a significant deterrent to many cruisers. Those who do, however, get to enjoy a true gem. Edenton’s first settlers arrived from Jamestown in 1658 and the town was incorporated in 1722. Edenton was North Carolina’s first capitol city. Settling citizens include a signer of the Declaration of Independence (Joseph Hewes), a signer of the United States Constitution (Dr. Hugh Williamson), the first United States Senator from North Carolina (Samuel Johnston) and one of the first Associate Justices of the United States Supreme Court (James Iredell), appointed by President George Washington. 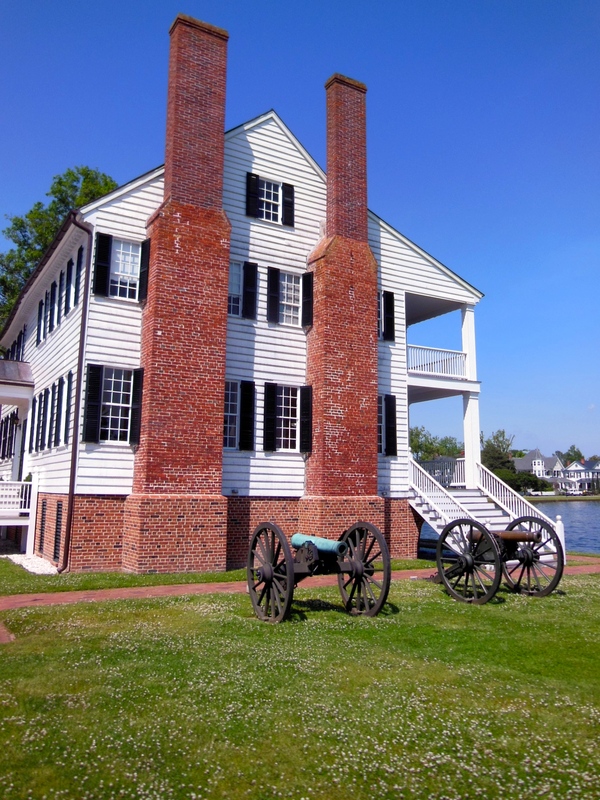 Edenton was second to Wilmington as the state’s largest colonial sea port. Shipping here included a robust trade with England and the West Indies. Access to Edenton by ocean-going ships was via the Roanoke Inlet until it was closed by a Hurricane in 1795. Prior to Emancipation, Edenton provided slaves with a means of escape via the Maritime Underground Railroad. For those interested in American History and/or architecture, there is a lot to see and learn here. In the years we aboard Sanctuary have been migrating north and south with the seasons, we have often heard that Edenton is an extraordinary place to visit. Edenton is a town of 5000 residents located on the north shore at the western end of the Albemarle Sound. From the Alligator River Marina at the Alligator River Swing Bridge, the cruise to Edenton is 49 StM. From Elizabeth City, the cruise to Edenton is 55 StM. Sanctuary and crew have always been “in too much of a hurry” to add several additional days to our migration travel itinerary. “’Too much of a hurry’ to do what,” I ask in hindsight? To visit Edenton, slow cruisers need to allocate two travel days to their itinerary, plus length-of-stay-at-Edenton days. Cruisers would want a nice, stable air mass to travel, or the willingness to “hunker down” and wait for the arrival of a comfortable travel-weather window. In 2014, for us, the necessary conditions came together, and we made the cruise in May. What we found was the most welcoming place I think we have ever been. The Albemarle Sound is a very significant body of water that is worthy of the utmost respect. The Sound is shallow, with an average depth of 12 – 13 feet. It lies east/west, with prevailing winds from the southwest and west. Any winds over 15 knots can produce steep, uncomfortable seas, but especially so along the east/west fetch of the Sound. Strong cold fronts, nor’easters and summer thunderstorms can produce serious anxiety. There are large, charted military security zones on both the south and north shores. The restricted area on the north shore is the inactive Harvey Point target range which has been disestablished as a danger zone. The area is open to public access for recreational and commercial uses, except that “dredging, clamming, crabbing, seining, and anchoring of all vessels and any other activity which could result in disturbing or penetrating the bottom” is prohibited. There are large, fixed platforms in this area. The larger area on the south shore is open to the public for navigation except when military exercises are being conducted. 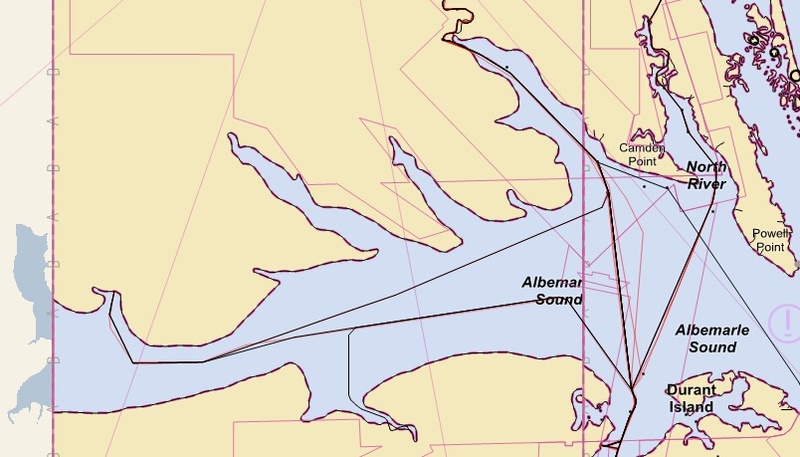 To avoid these security zones, through-cruisers are funneled away from shore toward the central one-third of the Sound. There is a 65-foot vertical clearance fixed bridge, and a 94-foot vertical clearance electrical primary distribution line that cross the western end of the sound, north-to-south. Neither pose a problem for cruising boats. Both have “official” marked channels at mid-span, but it’s likely that any span a mile or more offshore would be acceptable for cruisers. The Albemarle must also be a fertile fishing ground, because all parts of it are blessed with lines of crab pot floats. Because of the abundance of floats, I would recommend against traveling at night. The entrance channel to Edenton Harbor is charted at 7-1/2 feet, but we saw no less than 12 feet. 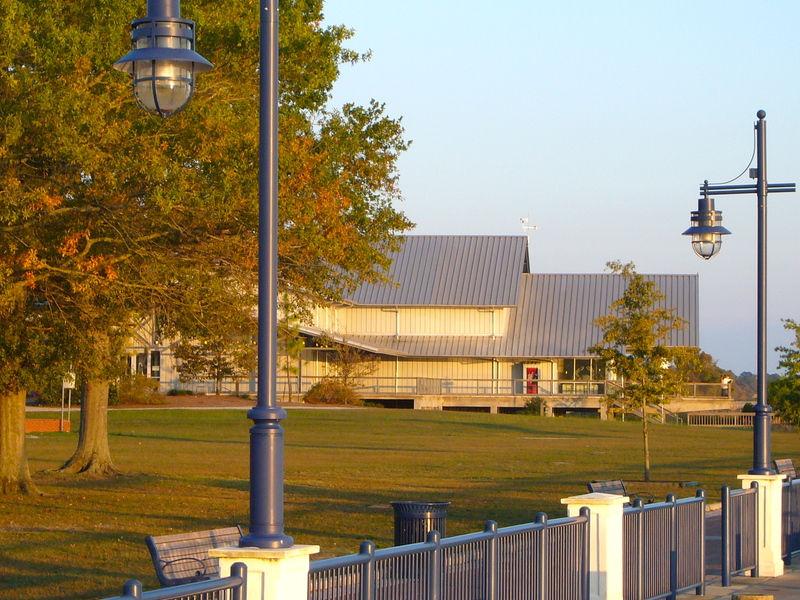 The Edenton City Docks are part of a large recreational park ground. The yacht basin is surrounded by a concrete breakwater to protect it from seas rolling in from the sound. The breakwater has a 6 foot or so opening on the east end, which does result in some wave action within the basin. There is no tide, but winds can affect water levels at the margins. Entering Edenton Harbor, the channel hooks from north to west, and the city docks are immediately to starboard. To the west of the property, the Roanoke River Lighthouse is the prominent land feature. Boat access to the basin is from the west end. At our arrival, we had excellent docking assistance. Dock pedestals provide 30A and 50A power and potable water. In-slip depths are 8 feet. Docks are fixed wooden structures, aging, but structurally sound. Rest rooms and showers are available in a building adjoining to the park. These facilities are showing some age. Wi-Fi is available, free and open; no passwords. The wi-fi is sufficient for email and browsing. The dockmaster provides a “Welcome Package” with guidebooks and maps of the town. 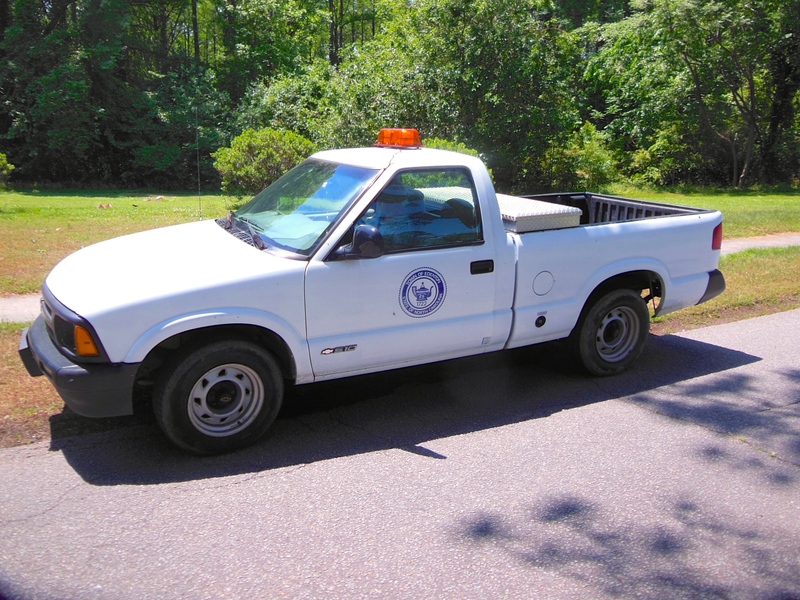 The dockmaster also provides a pickup truck, “City of Edenton, State of North Carolina” logo on the side and with yellow light atop, that she lends to cruisers as a complimentary courtesy car. Without doubt, it’s the most unique courtesy car we’ve ever used! The marina offers the first two nights of dockage without charge, but with a $6.00 charge for electricity. Thereafter, dockage is $1.00/foot. We thought that was an excellent offer, reminiscent of many towns along New York State’s Canal System. Edenton is very special for its extensive historic district of surviving 18th Century Georgian, Federal and Greek Revival architecture. Immediately across the street from the marina is the c. 1782 Barker House, one of several homes dating to the early 18th century. 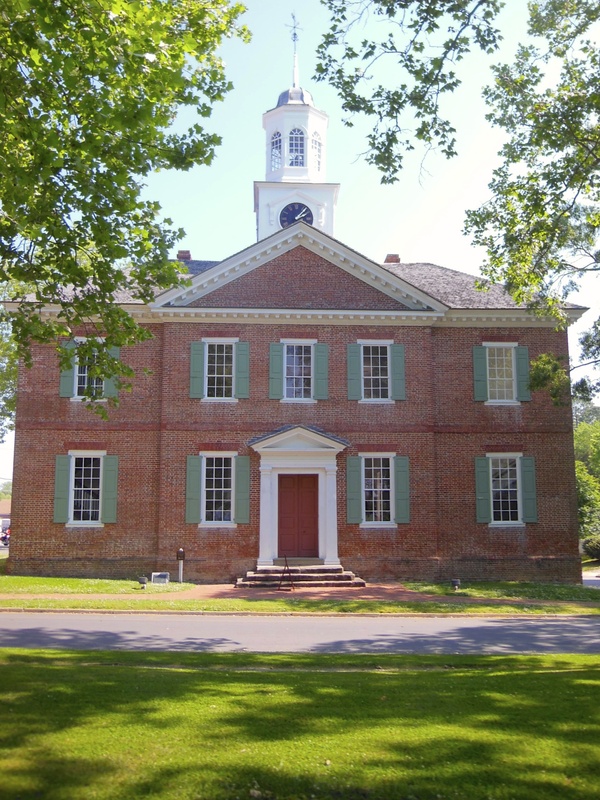 In town is the 1767 Chowan County Courthouse, a National Historic Landmark. 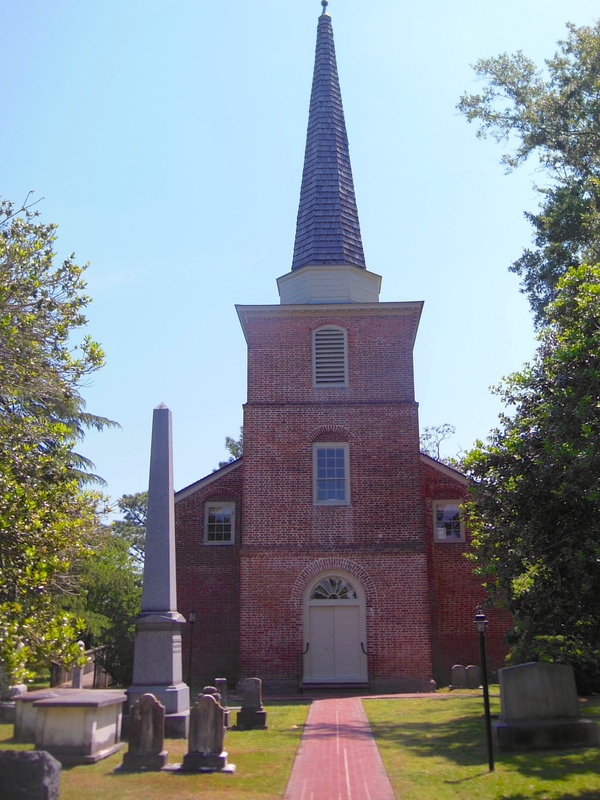 Also in the downtown, within walking distance, are the 1736 St. Paul’s Episcopal Church, 1758 Cupola House and gardens, and the 1800/1827 James Iredell House. There is much, much more. The Chowan County Courthouse is still used today by the County, NC District Court, and the State Supreme Court. Two 18th Century “Customs Houses” that supported merchant shipping and trade still stand in Edenton. Most Americans (well, most Americans in our generation of cruisers) know about the “Boston Tea Party” in response to the “Tea Act of 1773.” The Provincial Deputies of North Carolina supported their countrymen in Boston by resolving to boycott all British tea and cloth received in the North Carolina colony after September 10, 1774. 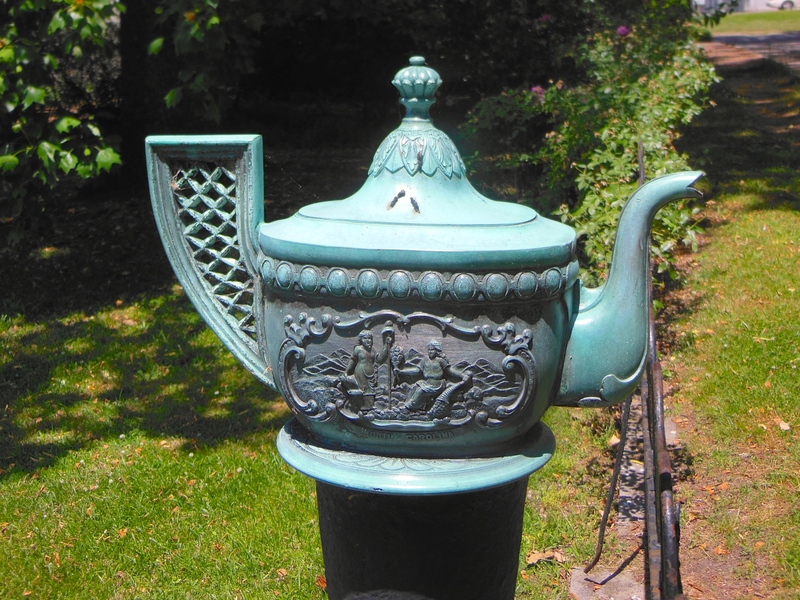 We learned in Edenton that there were several towns in colonial America that held tea parties in sympathy with the people of Boston. Edenton was just one such town, but it was unique. The Edenton Tea Party was one of the earliest organized women’s political action protests in United States history. On October 25, 1774, Mrs. Penelope Barker organized, at the home of Mrs. Elizabeth King, 51 women of Edenton. They formed an alliance supporting the American cause against “taxation without representation.” Political resistance was common in that day, but political resistance by women was not. The action of these 51 women got significant notice in England. Walking around Edenton, it was very obvious we were tourists. Grasped in our hands, and managed clumsily, were our walking tour guidebook, street map and camera. Many nice folks asked us if they could help us find something. Many nice folks wanted to know where we were from. Many were amazed and engaged by our lifestyle choice to actually live on our boat. Merchants and restauranteurs were friendly, cheerful and obviously appreciated our visit and our business. We enjoyed dinner at “The Downtown Café and Soda Shoppe” (American) and at “Kristy’s Place” (Italian). Our meals were excellent value; simple, delicious, featured good service, and were inexpensive by any contemporary standard. Edenton is truly a delight. We highly recommend it as a cruising destination! This entry was posted in Albemarle Sound & Edenton on 2014/05/15 by gilwellbear. south. Imagine Jacksonville city located at the transition from the handle and the paddle. This 24-mile stretch of the St. John’s River offers an eclectic mix of vistas which include expansive bridges and overhead power lines, a coal-fired electric generating station that has cooling towers resembling those of a nuclear power plant, large scale military and civilian shipping/seaport infrastructure, large southern mansions, residential neighborhoods with docks lining the shoreline, and undeveloped marshlands. Quite a mix. 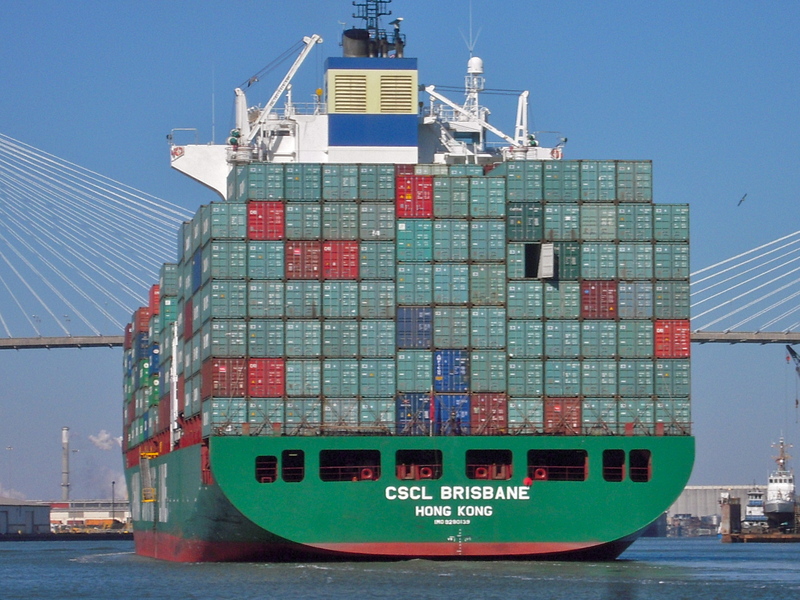 Between the ICW crossroads and the City of Jacksonville, virtually all of the commercial seaport infrastructure is on the “north” shoreline. This includes cargo terminals and fuel terminals with docks that extend well into the river. By contrast, the “south” shore has very little large-scale commercial development. Jacksonville city itself occupies both sides of the river. Beyond Jacksonville city, the river turns south, widens and shallows. The current in the St. John’s can run to 3 knots at ebb, which can be of significant help or hindrance to slow and/or low-power vessels. Navigation of the river can be very easy. Along commercial channels, Sanctuary and crew prefer to operate just outside the shipping channel lateral markers. On the St. John’s, we chose to run the “south” shoreline. That keeps us well away from the various security zones along the commercial “north” shore. However, on the south side, we did encounter numerous crab pots, some in as much as 40’ – 50’ of water. Crowley triple-decker barge, tugs fore and aft. Concentration and situational awareness are essential on the St. John’s. Vessels encountered on the river will include open rowboats, kayaks and canoes, all variety of pleasure craft, large and small cruise liners, very large tows, research, military and commercial cargo vessels. 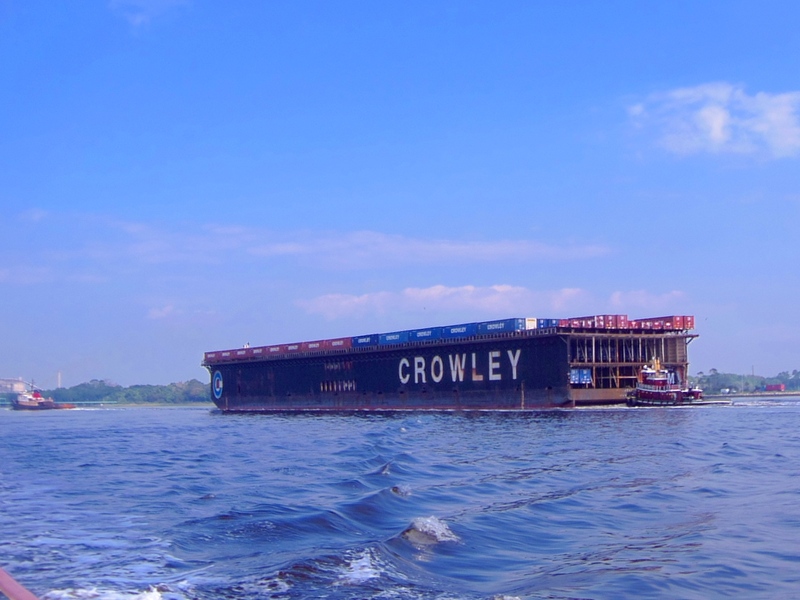 The large Crowley barge tows accommodate 3 levels of tractor-trailer and RR freight car-sized vehicles. These very large barges are managed by multiple towboats, with one tug pulling the barge, via cable, and one or more tugs handling the stern swing of the barge. Via AIS, they appear as a tight cluster of slow-moving vessels, but they definitely occupy a lot of river. 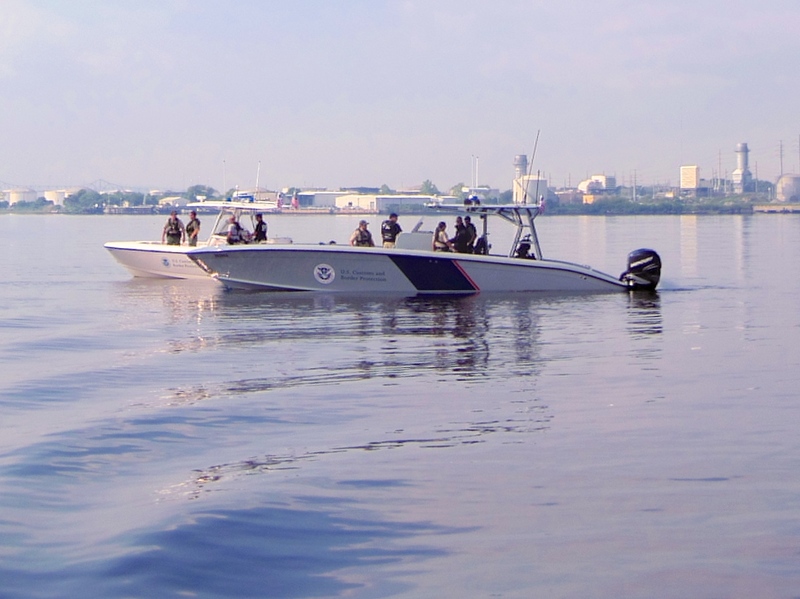 As might be imagined, there are many law enforcement swift boats from several agencies, including US navy and USCG patrol boats, Customs & Border Protection, Immigration and a plethora of state and local authorities. On the north shore of the St. John’s, approximately 7 miles east of downtown, is Trout Creek. This creek offers anchorage and marina options to cruising boats. Just east of downtown, there is a public marina with floating docks, power and water. Dockage is free; power is $8.50/day. The stay limit is 72 hours. Downtown at Jacksonville Landing, cruisers can tie up to a free wall. This location is a no-wake zone. There are no services, but it’s fine for the self-sufficient cruiser. Local attractions at the location include Chicago Pizza, Hooters and a variety of local eateries. 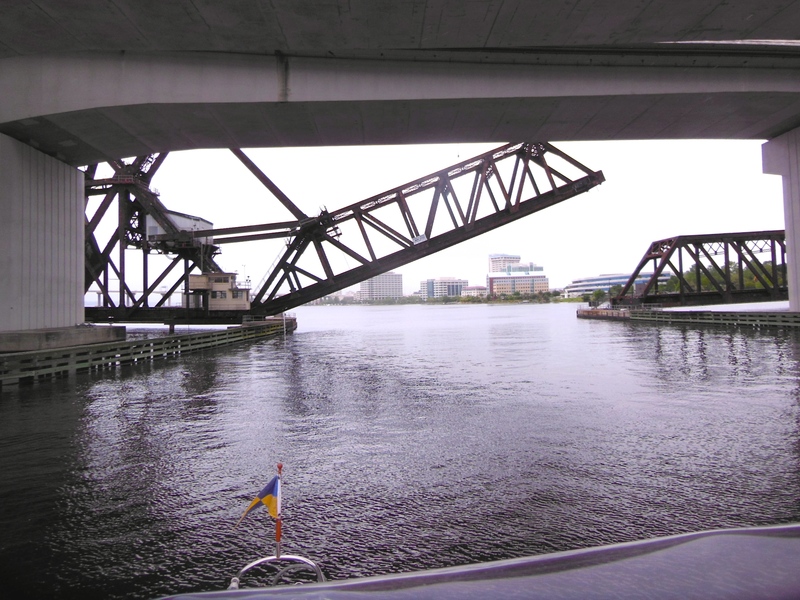 FEC Railroad bridge, Jacksonville Landing, viewed inbound from under I-95, caught in the act of opening. Proceeding southwest through the FEC RR bridge, the St. John’s turns south and the character of the river changes. It’s just a short 2 – 3 mile run to the Ortega River. The Ortega River is reached by turning to the southwest (260°) at approximate position 30°17.35’ N, 081°40.6′ W. There are no obvious landmarks except for a large, square building on the western shoreline. The Ortega is marked red-right-returning, and boats coming from the St. Johns are “returning.” Honor the markers. 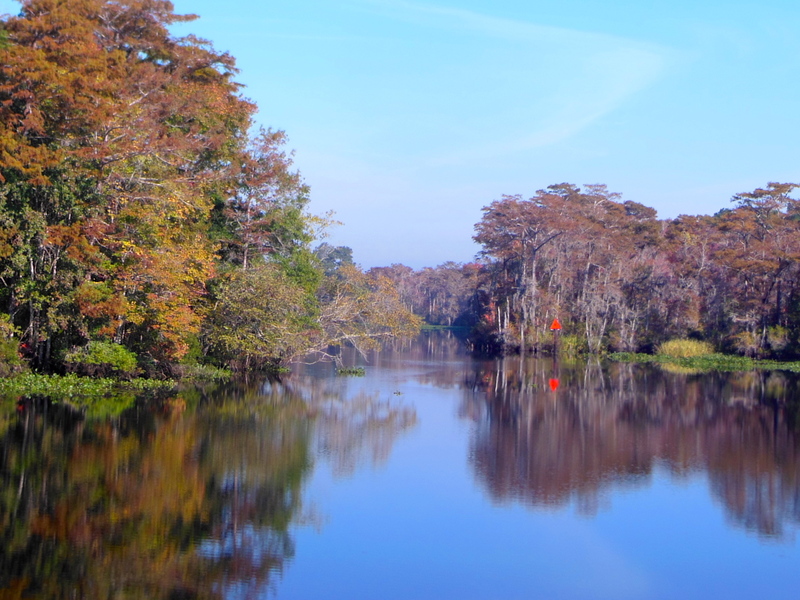 The Ortega River boat channel carries 10’ – 12’ and is well marked. 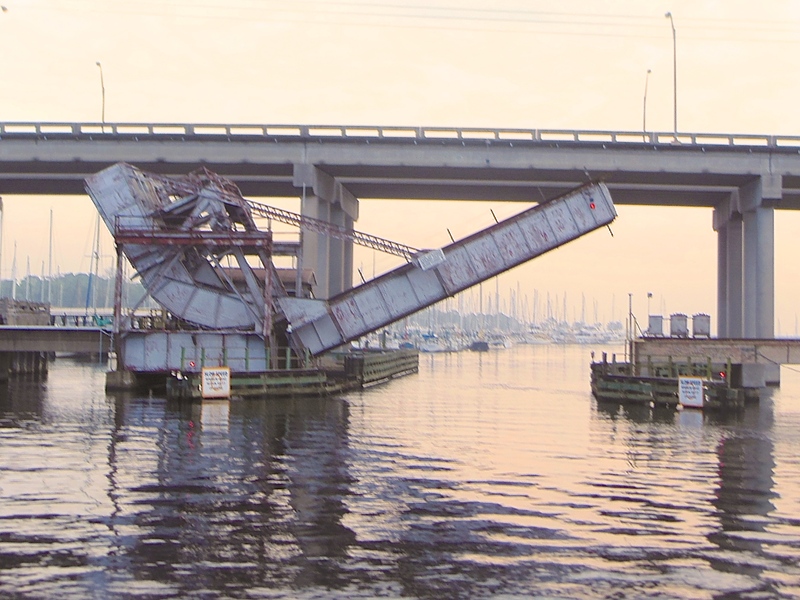 There is a road bridge (Ortega River Bridge) that most boaters will need opened. Depending upon final destination, there is a CSX/Amtrak railroad bridge that boaters may need opened. The road bridge is not restricted. The RR bridge is normally opened except when a train is approaching. The RR bridge is an old single-track bridge that carries the classic Amtrak east coast passenger services, like the Silver Meteor, Silver Star and Auto-train. The RR bridge periodically experiences operational problems. Plan accordingly. There are several large marina and boatyard operations along the Ortega River. Note particularly Lamb’s Yacht Center, which has a 100-ton boat lift and a large, well stocked onsite chandlery. Lamb’s allows liveaboards, and the folks there – staff and residents – are very friendly and helpful. I would suggest that this area is not truly a “destination” in itself, but if planning to have work done or needing to take cover from nasty weather, it is a good, safe, secure refuge. There is a full-scale shopping center within walking distance. The shopping center boasts a Publix, CVS, UPS Store, West Marine, Belks, and several restaurants. The “Metro restaurant” is especially good for breakfast. “Tom and Betty’s” is great for home cooking at reasonable prices. There is a large marine consignment operation (“Sailor’s Exchange;” http://www.sailors-exchange.com/) and a large “used book” store operation (“Chamblin’s Book Mine;” http://www.chamblinbookmine.com/default.aspx) in that immediate neighborhood. Bus service is available to downtown Jacksonville. US Rt. 17 is less than 5 minutes from the Ortega River marinas. This entry was posted in St. Johns River - ICW to Ortega R. on 2014/04/27 by gilwellbear. Sanctuary and crew made our first visit to Conway, SC, on the Upper Waccamaw River, on October 29 and 30, 2013. On the advice of the dockmaster at Osprey Marina, we departed the ICW at Enterprise Landing, at daymark G”1.” The channel in that area is narrow, and shoals to 7-1/2 feet for a short distance. Once past that area, the river widens and become a magnificent cypress swamp meandering stream. Navigation planning was only slightly more complicated than usual. “Standard” NOAA charts do not cover the upper Waccamaw. The rule is, as always when upbound, “red, right, returning.” The river is adequately marked with clearly visible daymarks. Navigation is straight forward. We stayed to the middle of the river on longer, straighter stretches, and favored the outside radius of turns and switchbacks. From the ICW at Enterprise Landing to Conway, a cruise of approximately 16 StM, there are three shoal areas: first, just above G”1,” second, in the vicinity of R”12,” and third, in the vicinity of R”16.” We never saw less than 7-1/2 feet in any of these areas. There is a tidal ebb and flood, but these currents are insignificant for cruising boats. We stayed at the Conway City Marina. The marina “basin” is on the west shore of the river. Upbound, the marina entrance is on an eastward curving bend in the river. The tidal range is about 18 inches. Reports published elsewhere of shoaling across the marina entrance are correct. Local guidance is to favor the green center-quarter of the marina entrance when entering and leaving the enclosed basin embayment. We were in the red-center quarter upon arrival, and even though we arrived virtually at high tide, we plowed through soft mud in the immediate area (50 feet) of the basin entrance. The second day of our visit, we chose high tide to relocate to another dock. By favoring the green center-quarter at the entrance bar, we observed that the shoaling carries to the green side, but we cleared it in about 5-1/2 feet of water. There is rip-rap on both the green and red outside-quarters of the entrance, so caution and slow approach speed is advised. The Conway City Marina is a residential facility, not primarily a transient destination. As first-timers to the area, we had excellent telephone support from the attendant, and we were certainly made welcome. There is no docking assistance provided. The marina offers three docking locations. One is a floating face dock inside the marina entrance channel. There is a small resident river tour boat on the north end of that dock, and there is also room on that dock for 2, 40′ cruising boats. It’s actually a 1/4-mile walk to the office from this dock. Outside the marina, 1/4-mile upstream of the entrance channel on the west shore of the Waccamaw, there are two 40′ floating docks immediately below the SC Rt. 905 road bridge. These docks are part of an extensive and beautiful River Walk system. It’s a 1/2-mile walk to the marina office from these docks. All of the docks have 30A and 50A power. None have potable water available. The docks themselves are aging, and in a generally dilapidated state of repair. Cleats on the in-river docks are loose and somewhat small for cruising boats. That said, the in-river docks do have two obvious advantages: first, approach depths are better, and second, the walk to the town is much shorter and easier. It is a very long walk to anywhere from the dock located in the marina entrance channel. The City of Conway is the Horry County Seat (pronounced “Oar-ie;” the “H” is silent). There is A LOT of government here in Conway; a lot, including a large jail complex and the county courthouse. Discount coupons (“Discover Conway Downtown Shopping Card”) for visitors are available at the Visitor’s Center, 903 3rd Ave; (843) 248-1700. Get several cards, because you give up the coupon when/as you use them. History and architecture buffs will enjoy the city. There is a 2-1/2 mile riverwalk and park complex for walkers/joggers. There is a walking Heritage Trail of beautiful 19th century homes and the historic downtown. The locals are friendly. There are several good restaurant choices, and several nice, unique shoppes. Grocery shopping and the post office are not within what I consider to be walkable distance. Bikes would be an asset here. When Sanctuary and crew made this side trip to Conway, in October, 2013, the daymarks in the river were in good condition. 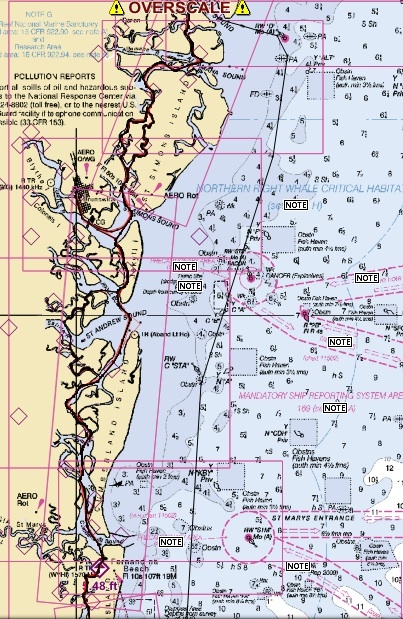 In December, 2013, the USCG announced plans to permanently discontinue the lateral daymarks on the upper Waccamaw River. There are, however, some large tributaries and embayments that intersect the river; some are large enough to be confusing to first time cruisers in the area. Since there are no NOAA charts of the upper Waccamaw that cover the River, I superimposed Sanctuary’s GPS track on a road map of the area. I hope this will be useful in portraying the through-route of the river to Conway. Southern Portion of Upper Waccamaw at Enterprise Landing, StM 375. Clicking on these picture graphics will display them in a full-screen view. Further clicking will magnify them and allow scrolling. They are of high enough resolution that detail should be easily visible. Despite some facility limitations and walking-distance challenges, this river trip is exquisite. It is unique, beautiful and well worth the effort. 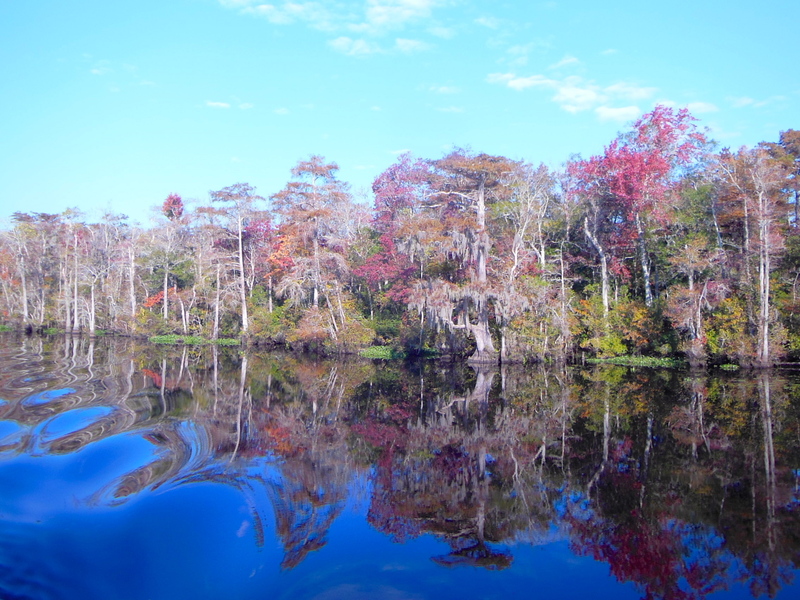 This entry was posted in Conway, SC; Upper Waccamaw on 2013/10/30 by gilwellbear. As part of our Fall, 2010, southbound snow-bird migration, Sanctuary and crew diverted from the standard A-ICW route. 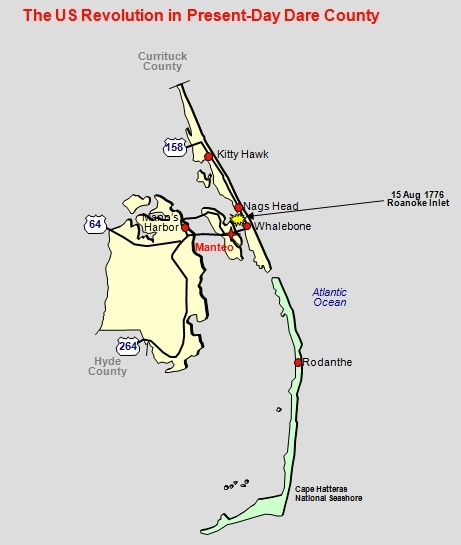 Instead, we transited from Elizabeth City, NC, to the North Carolina Outer Banks communities of Manteo and Ocracoke. When we later departed Ocracoke, southbound, we crossed the Pamlico Sound to Oriental, NC. Manteo and Ocracoke are thoroughly enjoyable little towns. This Outer Bank route is 20 miles shorter than the traditional A-ICW route from Coinjock, VA, to Oriental, NC. It is, however, more exposed to open water on the Pamlico Sound. The open-water Pamlico crossing is about 35 StM, so cruisers are reminded to pay particular attention to marine weather conditions and the near term weather forecast prior to departure from Ocracoke. Because the Great Sounds of North Carolina are shallow, in most areas ranging from 10 to no more than 18 ft., winds of 15 – 20 kts will create short period, steep, uncomfortable seas. Also, crab pots abound, and can be hard to spot if seas are up. 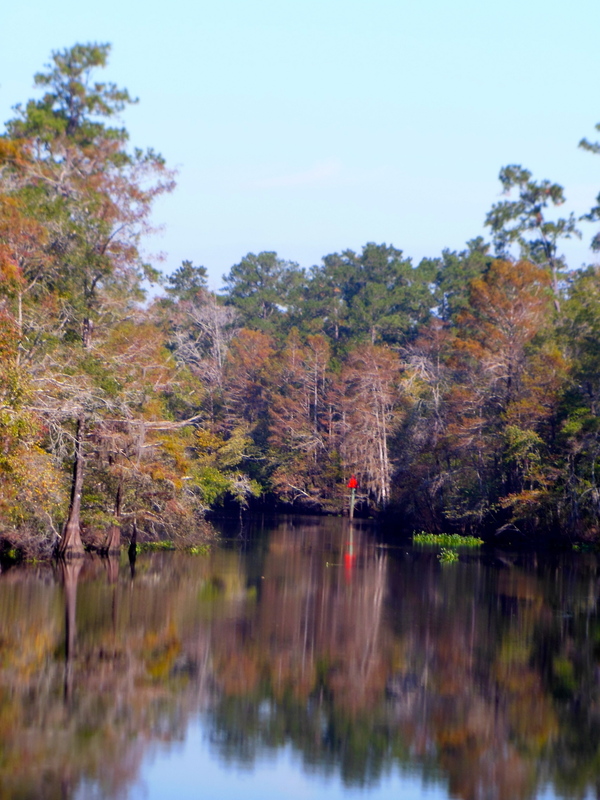 Sanctuary and crew recommend this route as an excellent “side-trip” and refreshing alternative to ICW route through the Alligator River, Alligator River Swing Bridge, and the boring and tedious Alligator-Pungo Canal. We transited to Manteo by traversing the Albemarle Sound from Elizabeth City to Croatan Sound. On this route, there are no navigation or piloting concerns, but we did encounter many, many crab pots. On the Albemarle, the helm watchstander must be constantly vigilant and alert. From the Albemarle, we entered the Croatan Sound Channel at its north end. We proceeded southbound to the northwest end of Roanoke Island, and then turned east to follow the marked traverse eastbound across the northeast end of Roanoke Island, where it intersects the Roanoke Channel. We turned south in the Roanoke Channel and followed it into Roanoak Sound to its intersection with the Manteo Harbor Entrance Channel. 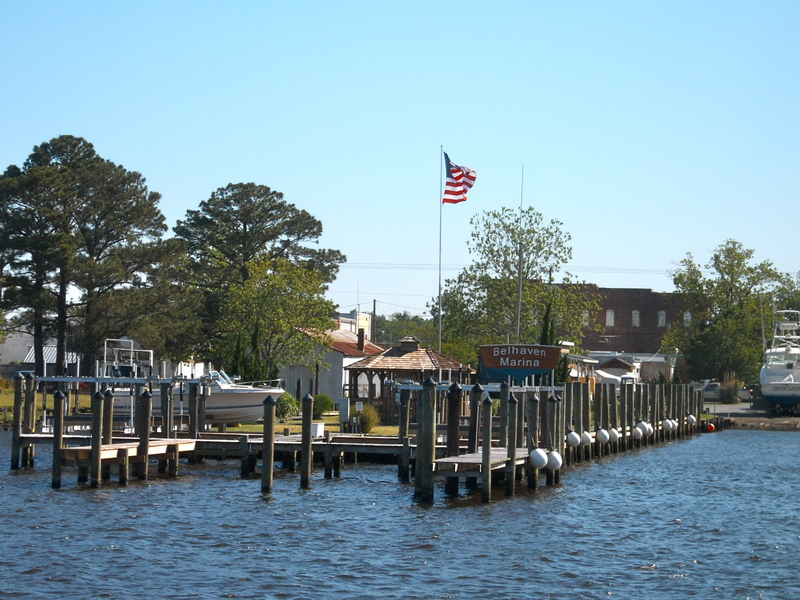 Manteo Harbor is shallow and requires cruisers to stay in the network of marked channels. The Roanoke Channel, from it’s northern beginnings above Manteo, carries as little as 7 ft to it’s intersection with the Manteo Harbor Entrance Channel. South of the Manteo Entrance Channel, the Roanoke Channel carries at least 9 ft for it’s entire length; in most areas, we saw 11ft to 14ft. The sailing vessel Elizabeth II, which draws 8 ft, regularly uses this channel. The channel is quite narrow, probably 100 ft. It is not a “No Wake” area. Thus, our plan was to “take our half out of the middle,” which was OK at 07h00 on a Monday morning. There were, however, two areas that caused some confusion for our stalwart captain. The first was a couple of miles south of Manteo, at the US64/US264, 65 ft fixed highway bridge. As we emerged southbound from under that bridge, there is a square “No Wake” sign on a post just on the east side of the channel. With the sun low on the morning horizon, I nearly mistook that sign, by shape, for a green lateral marker. It is not a lateral marker; it is a “caution” sign. The second area of confusion was another 2 – 3 miles south of the bridge, where there is a side-channel that runs off to the west, into the village of Wanchese (pronounced: WAN-cheese). In that area, the south-running Roanoke Channel takes a modest dog-leg to the east, and then another, back to the south. It took me a minute looking through the binoculars to actually realize there was a side-channel intersection there, and I found it momentarily confusing. It’s also narrow. The helmsman must carefully identify the markers for the Roanoke Channel. At it’s south end, the Roanoke Channel turns sharply southwest. In another mile, where the Oregon Inlet Channel intersects from the ocean, it becomes the Old House Channel. There are several new markers there that were not mentioned in the then-current cruising guides, and were only reflected on electronic charts that had recent LNMs incorporated. On the Roanoke channel, the new markers include 37A, 37, 36A, 36, 34A and 34. At the entrance of the Old House Channel (which is just a continuation of the route from the Roanoke Channel into Pamlico Sound) there is a new green-over-red marker, “OH.” The rest of the Old House route into Pamlico Sound is well marked and unremarkable. The route across Pamlico Sound is, likewise, unremarkable. Navigate the Pamlico Sound to the Big Foot Slough Channel that leads from the sound into Ocracoke’s harbor. Note here that the North Carolina State Ferry System uses this channel. Draft for pleasure craft in the channel is not a problem, but if cruisers encounter a ferry in that channel, carefully avoid the prop wash! The prop wash is very, very strong, and definitely enough to set a cruising boat out of the channel. There is a red-over-green junction marker just beyond R4 and G3. Watch for the correctly charted shoal there, and turn 120º or so to port, into the entrance channel leading to Ocracoke harbor, called “Sliver Lake” on the charts. In Silver Lake harbor, inexpensive dockage with 30A and 50A power and water is available at the US National Park Service docks. At end-2014, beginning-2015, the NPS docks were upgraded. They now have electric pedestals that are ground-fault protected (Equipment Protection Devices – EPD) to the newest National Electric Code requirements. Some cruising boats may encounter problems if there are previously unknown, previously silent ground-faults or leakage-faults aboard the boat. The NPS docks are adjacent to the NC State ferry docks. In this harbor, there is plenty of room for 20 or more boats to anchor. The harbor is very well protected from the strong periodic winds that frequent this island, located as it is about 20 miles off the mainland into the Atlantic. This entry was posted in Manteo, Ocracoke on 2013/06/17 by gilwellbear. North Carolina presents one of the longest stretches of single-state travel distance on the A-ICW. The state has a wide diversity of maritime environments. 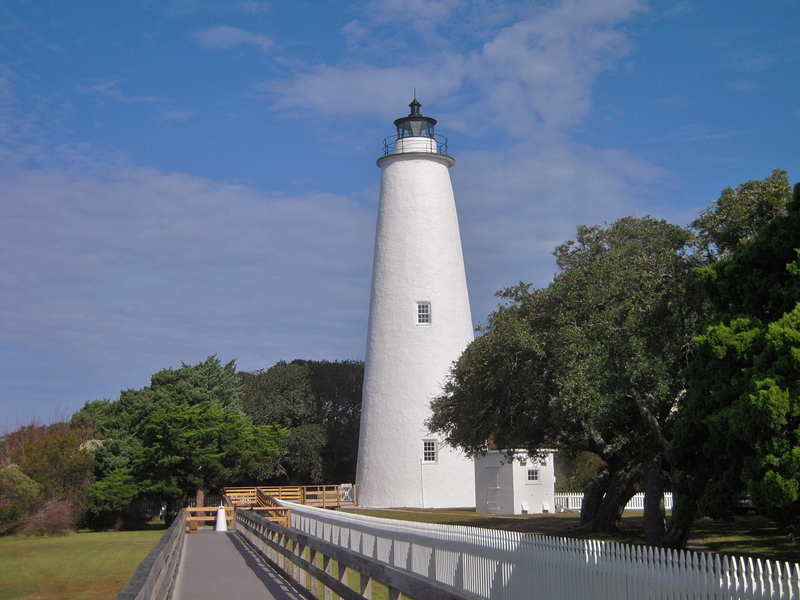 The southwest coast consists mainly of barrier islands and salt marshes. The tidal range in the southwest region of the coast is 3 – 4 feet, less than at Charleston, but significant. In the northeast sector of the state, the ICW transits man-made canals, the great inland sounds and their river tributaries. Tidal ranges on the great sounds – the Pamlico and the Albemarle – and the great rivers – the Tar-Pamlico, the Pungo and the Neuse – is negligible. Travel here is more often east-west than north-south. There are several places in North Carolina where alternative cruising routes are available. The A-ICW is the main through-route, but there are several delightful alternatives from which the cruiser can choose. Entering North Carolina from South Carolina, northbound, cruiser’s are immediately faced with aternatives. Option one is an easy offshore transit from Little River Inlet at the state line to the Cape Fear River entrance. Option two follows the A-ICW route. For Sanctuary and crew, the choice here is based, first and foremost, on wind and sea conditions offshore, and then on the state of the tide. The offshore travel distance is in the range of 25 StM, and for us, takes 2-1/2 to 3 hours. There are no significant offshore shoals or navigation concerns. 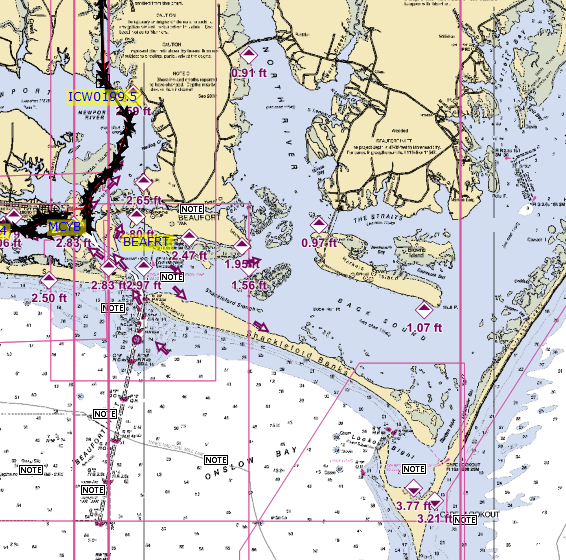 The offshore route rejoins the ICW through-route in the Cape Fear River, north of the city of Southport, NC. The ICW travel distance from the state line to Southport is slightly shorter than the offshore route, but often takes more transit time because of currents, speed zones, inlet crossings and local boat traffic. Local boat traffic can be quite tedious and challenging on summer weekends. The Little River Inlet is used daily by commercial Casino Boats working from North Myrtle Beach. The Little River Inlet entrance channel is wide and well marked. The shallowest area is right at the intersection of the inlet with the ICW, at the “Calabash Crossroads.” As with all meandering waterways, it is generally best to favor the outside radius on bends for best water depths. Currents in this area can be swift at max flood and max ebb. The offshore route to the Cape Fear River is straight and near-shore. Entry to the Cape Fear can be done by staying very near shore and following the correctly charted swash channel, or by staying farther off the shoreline and intersecting the Cape Fear Entrance Channel. Again, currents in the Cape Fear can be very swift – approaching 3 kts – at max flood and max ebb. These swift currents will significantly impair or assist the progress of slow trawler/sailboat/cruiser-type vessels. 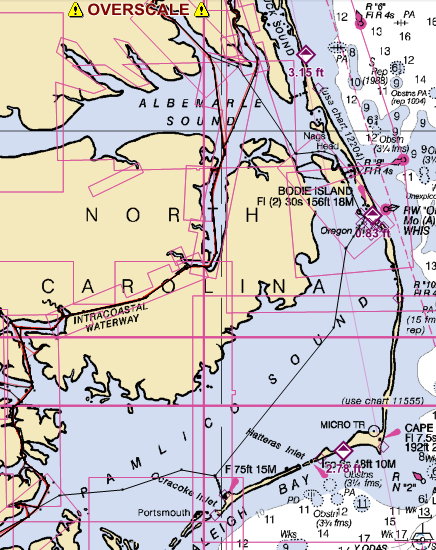 The ICW route between the NC/SC border and the community of Southport, NC, does include two potentially challenging pilotage areas. These are the well-known inlet crossings at Shallotte’s Inlet (at StM 331) and Lockwood’s Folly (at StM 322). Because of the moderate tidal range and swift tidal currents in this region, conditions at these inlet crossings are highly variable and change rapidly. Even soon after dredging, these areas shoal quickly. The ICW in this area is marked with lateral daymarks placed on pilings, except at these inlet crossings, where there are floating red and green buoys arranged and placed as lateral markers. The inlet crossings are not charted. Do not depend upon the charted “accuracy” of the “ICW magenta line” anywhere, but especially, NOT in this area. A day or two ahead of your arrival in this area, ascertain for yourself the up-to-date, current state of these inlet crossings . Do this in consultation with reliable online resources such as http://www.cruisersnet.net, http://www.waterwayguide.com and http://www.activecaptain.com. Consult with TowBoat US or SeaTow by VHF Radio for current conditions and local advice. As a precaution, try to plan your passage through this area at mid-tide or higher, rising if possible. Make sure to identify and distinguish between ICW markers and inlet markers. Confusing these markers can lead one to shoal waters. Be very alert for swift cross-currents, which can sweep a boat sideways into shoal waters. Although we can not know for certain, we believe swift cross-currents account for most groundings in this area. All of the grounded captains we’ve talked with have thought they were “in the channel,” but when viewed from a slightly more distant perspective, they clearly were not. Watch these cross-currents carefully, especially at mid-tide flood and ebb. Be wary of fishermen in small craft. Some are anchored immediately outside the ICW channel. Others drift throughout the channel and will often make sudden moves. These boats are highly maneuverable and generally know where cruising boats have to be. We always prefer, and make an effort, to maintain wide clearances with local fishermen, and yield, to avoid “close encounters.” However, the channel here is narrow, fishermen are often preoccupied with their own interests, and cross currents are unforgiving. So, hold your course and speed, don’t worry about your wake, and pass fishermen by closely if you must, lest you get swept aground. There are several marinas along the ICW approaching Southport from the south. St. James Plantation at StM 315 is well protected from foul weather and is a very nice facility with floating docks. There is a small onsite snack bar, but nothing else onsite or nearby. Just north of the second high-rise bridge at StM 311.3 is South Harbor Village Marina. This marina is on the ICW, and even though it’s in a “no wake” zone, the face dock is exposed to frequent wakes from passing boats. Inside the basin, within the protection of their floating docks, it’s very nice. There are two restaurants – one casual, one upscale – within easy walking distance. There is little else nearby. Southport Marina is in the village of Southport at StM 309. Once in the Cape Fear River, the ICW route follows the river north to Snow’s Cut. There are large North Carolina State Ferries on this part of the Cape Fear, but the river is wide and they will not affect the alert captain. Carolina Beach State Park is located at the southwest end of Snow’s Cut. Carolina Beach State Park has floating docks with 30A and 50A power and water, and modern, clean shower facilities. It is well protected from weather, but is not not within walking distance of shopping or restaurants. CBSP has a published LOA limit of 40′, but are somewhat flexible about it. This does not seem to be a popular stop, but we think it’s a gem for transient cruisers looking to overnight or wait out foul weather. There is a great side trip to Wilmington, NC, 10 miles upriver from Snow’s Cut on the Cape Fear River. There are several fine marinas in Wilmington. The Wilmington Marine Center is just east at Marker G”59.” This is a friendly and welcoming marina with a full-service yard and a full range of mechanical services. Continue upriver past the commercial seaport to two new marinas on the downtown Wilmington waterfront. There is an airport (ILG) at Wilmington that is useful for business and family travel and crew exchanges. WARNING: both raster and vector charts of the area show a channel called the “Wilmington Short Cut.” That charted channel leads northward from Snow’s Cut to the Cape Fear River. Do not follow that channel; it is shoal with depths of 2′ or less at MLLW. Instead, for safe water from Snow’s Cut to Wilmington, follow the marked ICW channel southwest to its intersection with the Cape Fear River Channel at ICW G”177,” navigate into a safe depth of Cape Fear River’s Upper Midnight Channel Range, and then turn 150º northbound towards Wilmington. Snow’s Cut is a short man-made canal that connects the Cape Fear River portion of the A-ICW nearby the Carolina Beach Inlet. At the east end of Snow’s Cut, just south of the A-ICW magenta line, there is a large embayment at Carolina Beach labeled “Myrtle Grove” on the charts. In Myrtle Grove, there is a new Town of Carolina Beach municipal mooring field. Anchoring is possible in the north end of Myrtle Grove basin. We aboard Sanctuary consider this to be a fair weather anchorage. Northbound on the ICW above Snow’s Cut, it’s about 15 miles to Wrightsville Beach at StM 283, where both anchorages and marinas are available for cruisers. About 3/4 mile west from the drawbridge is a mall with a West Marine store. The drawbridge is restricted to hourly openings, on the hour. South of the bridge, the waterway is narrow and can be very, very crowded. North of the bridge, the waterway shoals quickly on both shores. To us, this feels like a tourist trap. We anchor occasionally in the pool to the east of the village, but we do not use the marinas. 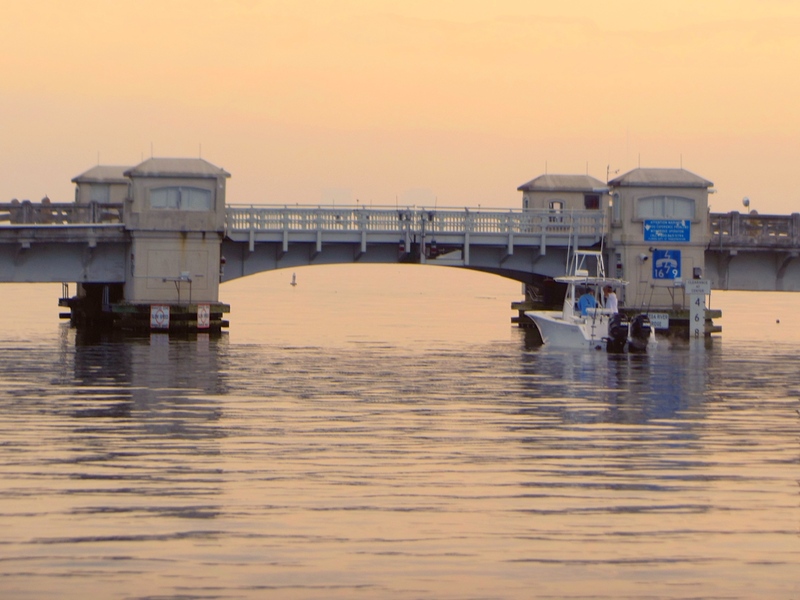 North of the drawbridge at Wrightsville Beach, there are three more drawbridges that many trawlers/cruisers and all sailboats will need to open: 1) Figure-of-Eight Island at StM 278, 2) Surf City at StM 261 and 3) Onslow Beach at StM 241. All of these bridges are restricted, and timing them is very important. Currents in the region reverse as inlet creeks are passed, so what looks like a fair current in one place can and will turn foul in another couple of miles. Generally, our strategy here is to run at speed until we are within about two miles of the bridge, then slow to time our arrival at the bridge about 5 minutes before its scheduled opening. Monitor the VHF (VHF-13) as all of these bridges will “adjust” their opening schedules to accommodate commercial traffic. Sometimes, that means you can get through early. Equally often, you may be delayed for a few minutes. There are few places to stop or anchor in this stretch. Plan accordingly. At StM 244.5, there is a popular anchorage on the northwest side of the ICW at Mile Hammock Bay. For your planning and awareness, this anchorage embayment is a US Marine Corps training area that is open for use by the public. Rarely, the Marines close the bay to pleasure craft. Occasionally, marine corps training maneuvers are conducted here, and can go on throughout the night. We have anchored there and enjoyed beautiful, peaceful overnights. However, we know cruisers who have rocked and rolled all night, too. Between StM 237.5 and StM 235 is the US Marine Corps Training Base at Camp Lejeune. Training operations at the base can cause full-stop closures of the ICW. Monitor VHF-16 in the hours before you arrive in this area so you can plan around any scheduled closures. Typically, the waterway will be closed from 08h00 – 12h00 and again from 13h00 through 17h00. In the fall, it’s already dark by 17h00. We learned the hard way that the bridge at Onslow Beach would open to allow traffic to proceed northbound… about two miles… whence we had to anchor in the channel for 3-1/2 hours. 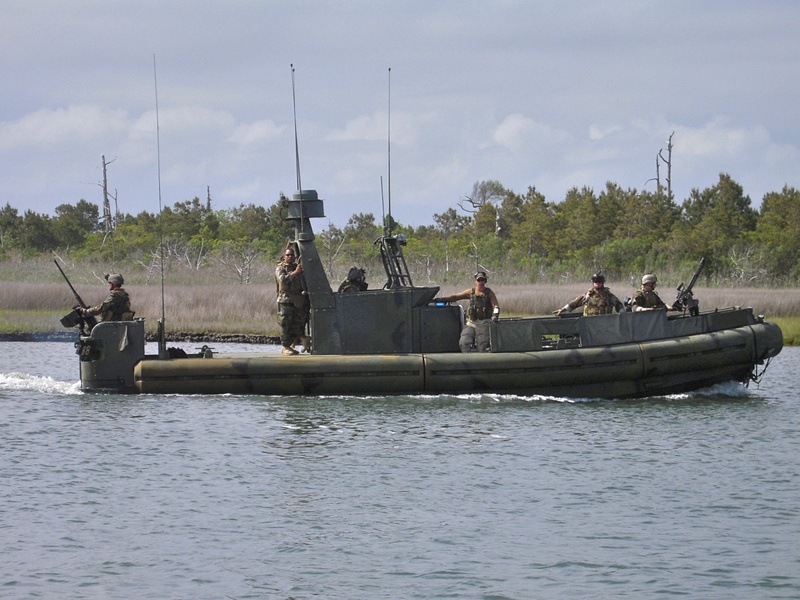 That afternoon, the Navy and the Marines were working a coordinated live-fire exercise between a firing range inland at Lejeune and 20 miles offshore. The gun reports were substantial. 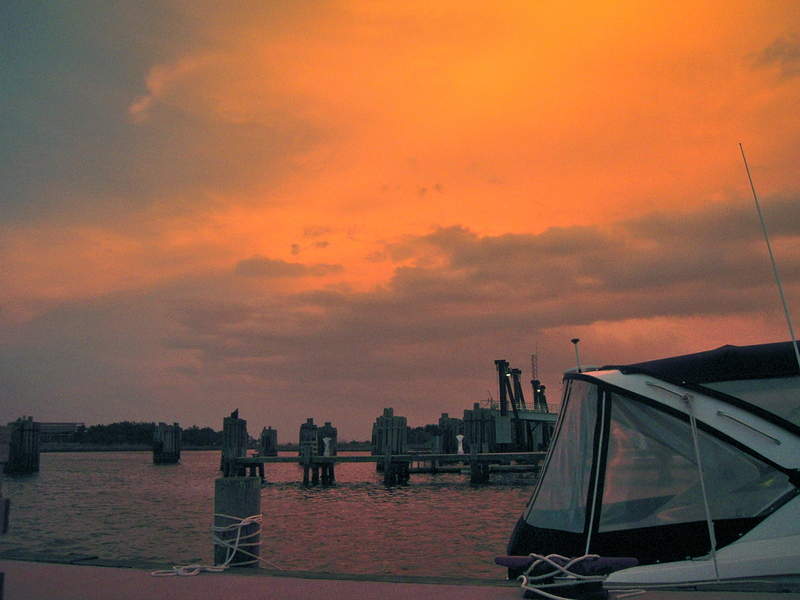 Needless to say, we arrived at Swansboro, northbound, after sunset. Occasionally, the range officer will allow boat traffic to proceed “at your best speed” through the training area. If/when we get such a travel window, we hustle. How often does all this happen? Well over 10 years, about one transit in four, so not that often. Southbound through here, our strategy is to depart Swansboro at “o dark thirty,” to be past Camp Lejeune before 08h00; before 07h30 is better! At StM 229, there are two marinas in Swansboro. One is Casper’s and the other is Dudley’s. Both offer fuel at competitive pricing for the region. Dudley’s is a combination marina and roadside mini-mart and gas station. Both components are big businesses in their own rights. There are restaurants in town, and the marinas will generally offer rides (but not use of a car). There is a small but fairly exposed anchorage with good holding in the area below the road bridge in the White Oak River. There are some small boat wakes, but that goes away after dark. Above Swansboro lies Bogue Sound. On charts, this body of water appears large, but it is very shallow and it is necessary to be meticulous about staying in the charted channel. Many daymarks are well outside the channel, so don’t crowd the markers. At StM 204 is the city of Morehead City. The general area of Morehead City and Beaufort, NC, might well be considered a destination stop. 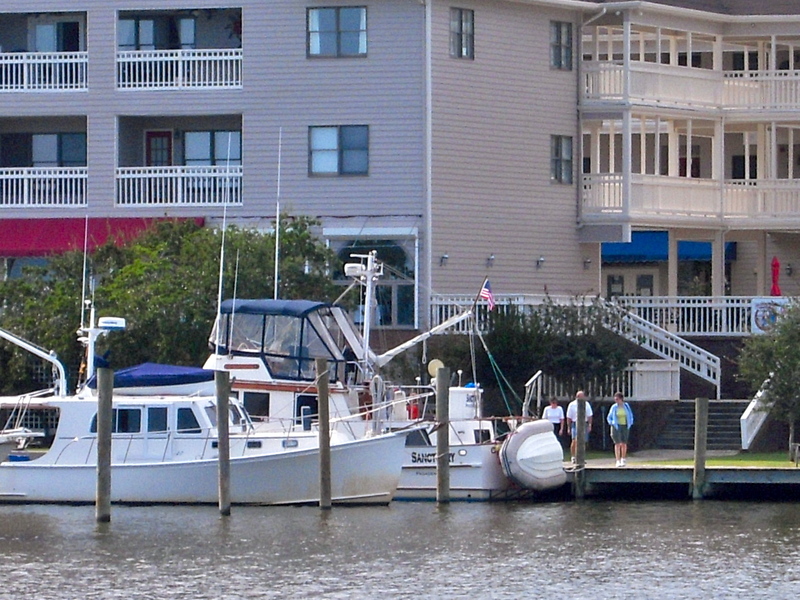 There are several marinas and restaurants in Morehead City in the Peanut Island Channel. 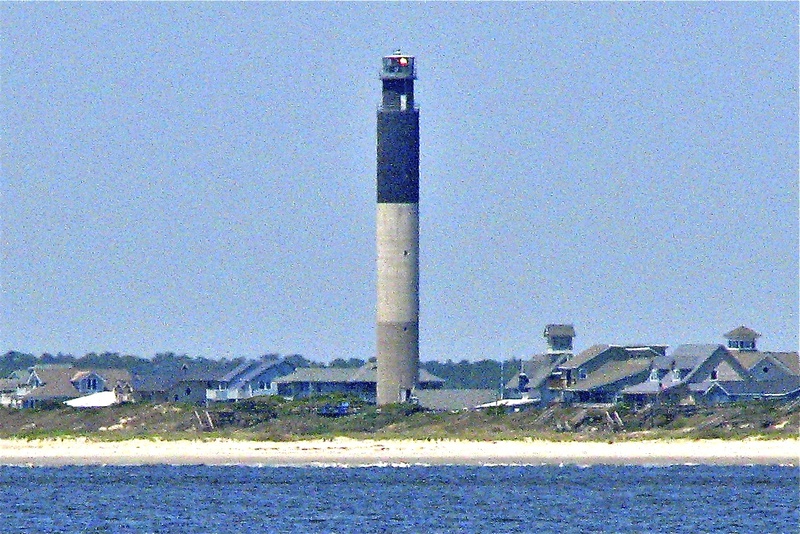 From Morehead City, there is access to the Beaufort Inlet and, offshore about 12 NM, the positively delightful bight at the Cape Lookout National Seashore. There is a superb marine-oriented hardware store in the downtown at 600 Arundel St. called Ace Marine and Rigging. These good folks stock stainless steel fittings, marine rigging materials, bulk anchor and dock line, and all kinds of maintenance items at very competitive pricing. North of the NC State Seaport, immediately above the highrise highway bridge and railroad bridge, there is a channel to the west that leads to the Morehead City Yacht Basin. This facility is very well protected from heavy weather. MCYB is a modern marina with floating docks, fuel, courtesy car and all cruiser amenities. It is within easy walking distance to restaurants, ACE Marine and Rigging, a NAPA Auto Parts store, and a beautiful Methodist Church. 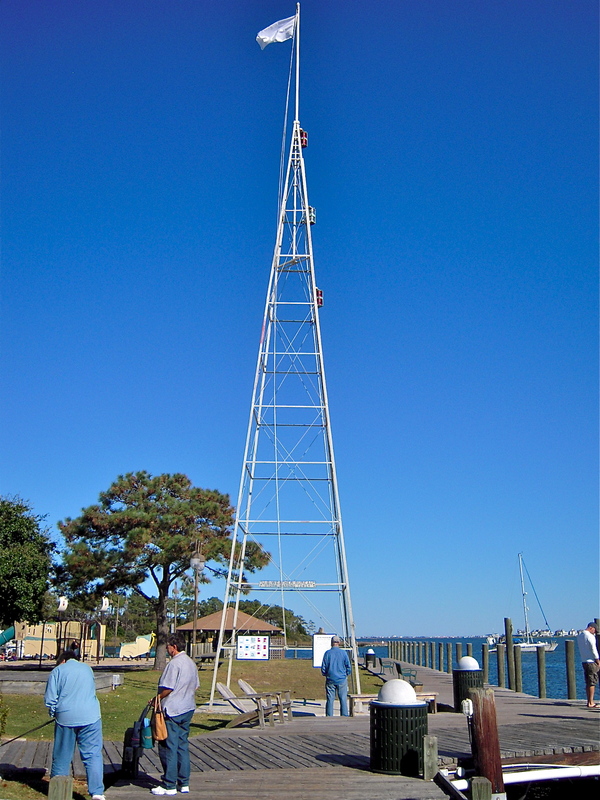 Four to five StM east of the ICW, at downtown Beaufort, NC, is a modern and popular – if expensive – municipal marina. 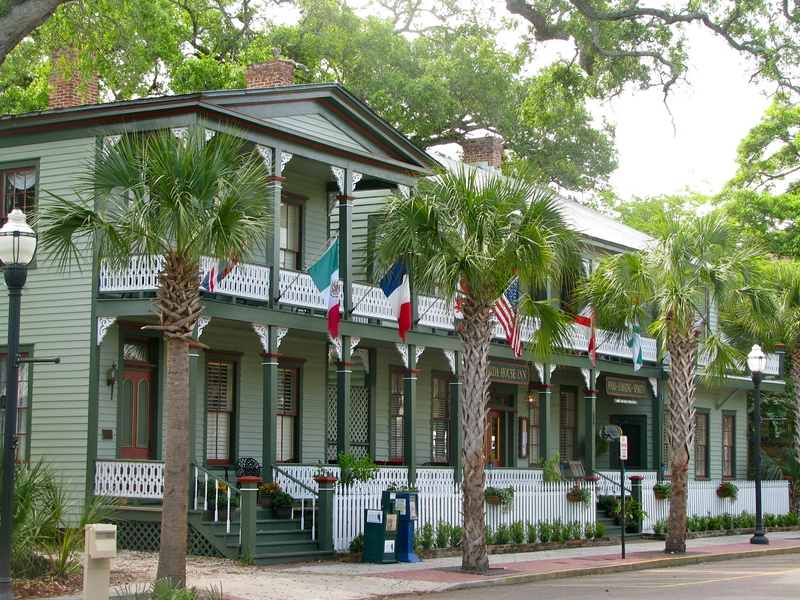 There are several restaurant options in Beaufort, of which our personal favorite is Clausen’s. There is also a North Carolina Maritime Museum, an excellent nautical book store, and a post office within walking distance. Cruiser’s can anchor in Taylor Creek, but it is crowded with local boats, including some apparent derelicts. North of Morehead City, the ICW transits the Newport River, Core Creek and Adams Creek northerly to the Neuse River. The Newport River area is well marked, but very shoal. Pay close attention to the markers in this area. 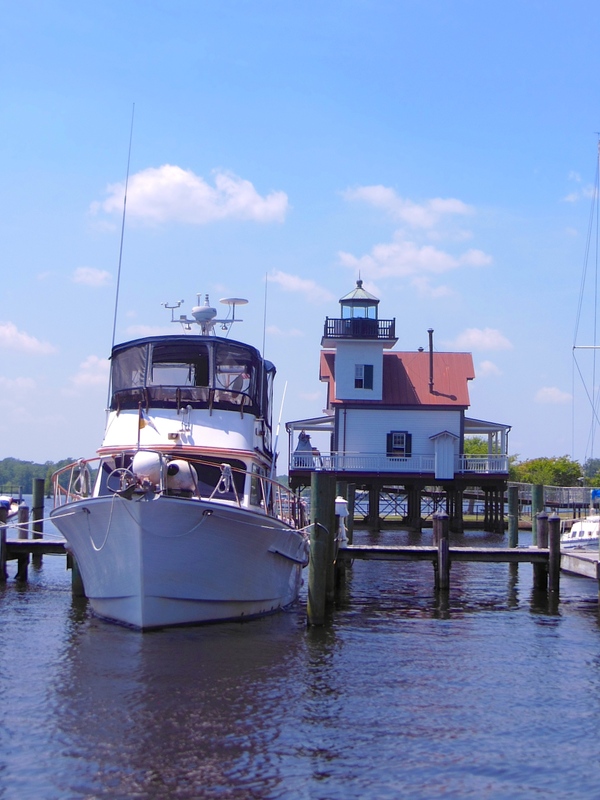 At the Neuse River, cruisers can turn to port to go upriver for a side trip to New Bern, NC, or proceed slightly stbd, across the river, to Oriental, NC. New Bern is a very nice and historic coastal city with a welcoming waterfront, several marinas, a great hardware store and many restaurant choices. Oriental is a much smaller, quaint old town, but also offers several marinas. Eight miles east of Oriental on the north shore of the Neuse River is Broad Creek, home to River Dunes Resort and Marina. River Dunes has floating docks, fuel, a courtesy car and all marina amenities for cruisers. It is very upscale, but also very affordable. It is our stop-of-choice in this area, particularly to ride out heavy weather. From River Dunes or an anchorage on Broad Creek, there is a choice of two route alternatives for the cruiser. Option one is to follow the ICW to Belhaven, NC, then to-and-through the Alligator-Pungo Canal to Columbia, NC, and then across the Albemarle, to either Coinjock, VA, or Elizabeth City, NC. Option two is to depart from the ICW, cross the Pamlico Sound in a northeasterly direction to Ocracoke, NC, then transit from Ocracoke, NC, to Manteo, NC, then cross the Albemarle to either Coinjock, VA, or Elizabeth City, NC. The Pamlico Sound route is actually shorter than the ICW route, but it does involve traversing the open waters of Pamlico Sound. The Pamlico and Albemarle Sounds are shallow, in most areas no more than 17-18 ft. The Pamlico Sound is well charted, and navigation is not a problem, but winds above 15 – 20 kts will create short period, steep, uncomfortable seas. The Option One route from Oriental via the ICW route turns northwest into the Bay River and enters a man-made canal through Hobucken, NC. The commercial seafood company, R. E. Mayo & Co., is located at StM 158. Cruisers are welcome to overnight here. Protection from weather is very good, but facilities are minimal, and so is the cost. Continuing northbound at StM 149.5, cruisers enter the Pamlico River just above it’s mouth at the Pamlico Sound. There is a wonderful side-trip here to the small cities of Bath, NC, and Washington, NC. At Washington, there is a municipal marina with power and water on the riverwalk. There are several shoppes and restaurant choices. The North Carolina State Estuarium is on the Washington riverwalk. 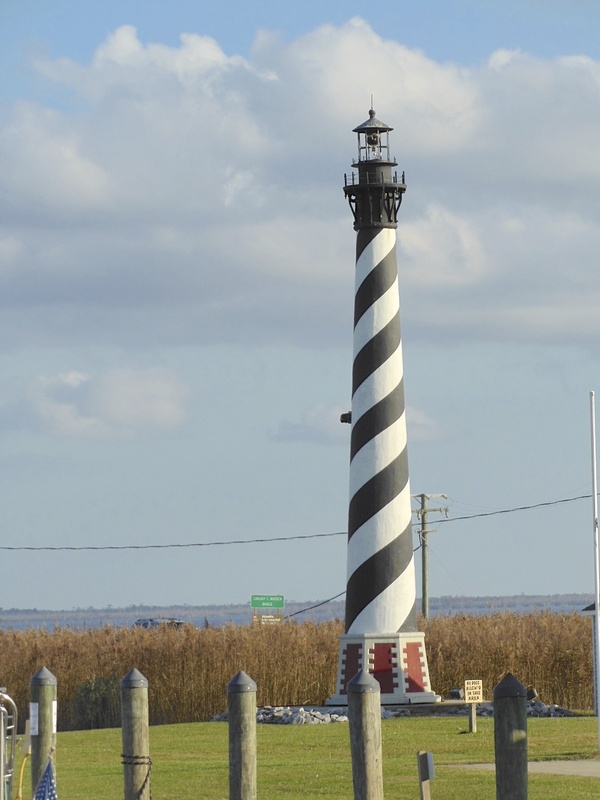 It celebrates the Tar-Pamlico Estuary, and is well worth a visit! Back on the ICW through-route, on the Pungo River at StM 140.5, to the east, is Slade Creek. This wide creek contains anchorages that offer good holding and heavy weather protection from every compass point. Belhaven Waterway Marine in Belhaven, NC. Belhaven, NC, is at StM 135. Our favorite place to stay to ride out weather of just relax is at the Belhaven Waterway Marina. Enter Pantego Creek through the Belhaven breakwater and stay at this wonderful, small, welcoming gem of a marina. Here, you have a short walk to the small town, a hardware store, pharmacy, a local heritage museum and otherwise limited shopping and restaurant choices. Marina owners Les and Brenda Porter can arrange a ride to the local Food Lion for re-provisioning and provide a full range of mechanical services if needed. There is another local marina at the Belhaven breakwater which we do not recommend. When departing Belhaven northbound, verify the acceptability of the weather forecast. Between Belhaven and the Alligator River Bridge, there are no facilities and only fair weather anchorages. The Alligator River Swing Bridge will not open if winds are consistently blowing 25 mph or more, so plan accordingly. Marvelous private lighthouse, Alligator River Marina, Columbia, NC. At the Alligator River Bridge, at ICW StM 84, on the western shore, is the very well protected Alligator River Marina. Stop and visit Ms. Wanda. Fuel prices here are frequently more competitive than regional averages. Ms. Wanda has an onsite restaurant that offers a limited down-home menu of excellent home-made “victuals.” This stop positions cruisers heading north for an early morning crossing of the Albemarle Sound, which is often the most desirable time of day for the 25 mile crossing. In the area north of the bridge, there are anchorages in the Little Alligator River, at Sandy Point on the Western Shore, and at East Lake/South Lake about 5 miles to the east of the ICW. Northbound above the Alligator River Bridge and approaching Albemarle Sound, be alert to the shoals. They change, and channel buoys are re-located from time-to-time. In some areas, floating markers are in place, but can be difficult to find and see. Cruisers must find them and honor them. Use online resources for current information. The Option Two route from Oriental via the Pamlico Sound departs the Neuse River to the northeast. Chart a course to Ocracoke, NC (42 StM). There are large North Carolina State Ferries on this route. Particularly in the Big Foot Slough Channel leading from the Pamlico Sound to Ocracoke’s Sliver Lake harbor, be careful to avoid the backwash of their powerful engines. The backwash is sufficient to sweep cruising boats out of the channel and into nearby shoals. At Ocracoke, there is an inexpensive National Park Service dock in Silver Lake that offers power, water and toilet facilities, but not showers, to cruisers. There is also a commercial marina available with a more complete package of amenities. Sanctuary and crew stayed at the NPS dock. We suggest cruisers rent a golf cart to tour around the island. There is a wonderful local history and heritage museum, and a large former Coast Guard station that is now a private conference center. There are many shoppes and choices of restaurants. 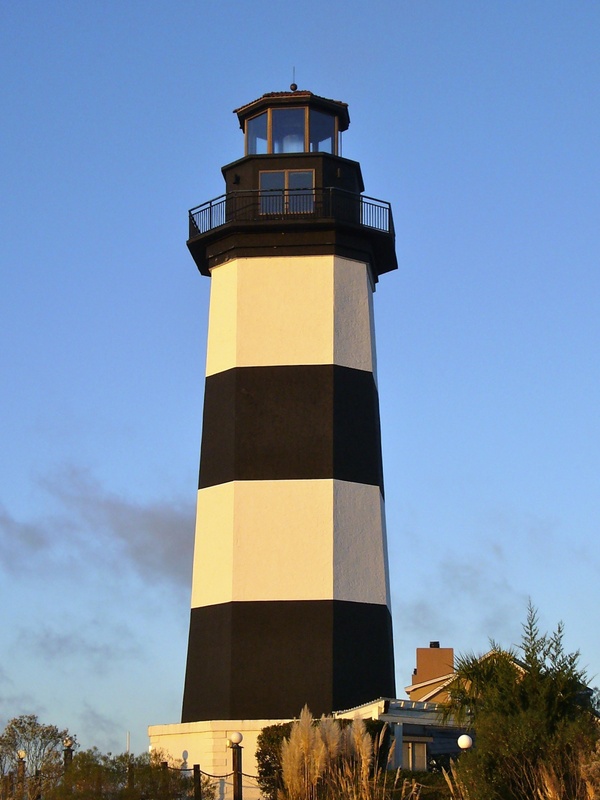 And of course, there is Ocracoke Light House. The light house tower is not open to the public, but the grounds are available. The cruise from Ocracoke to Manteo (67 StM) is documented on this blog as a separate entry, here: https://gilwellbear.wordpress.com/category/cruising-practica/us-east-coast/north-carolina/north-carolina-manteo/. 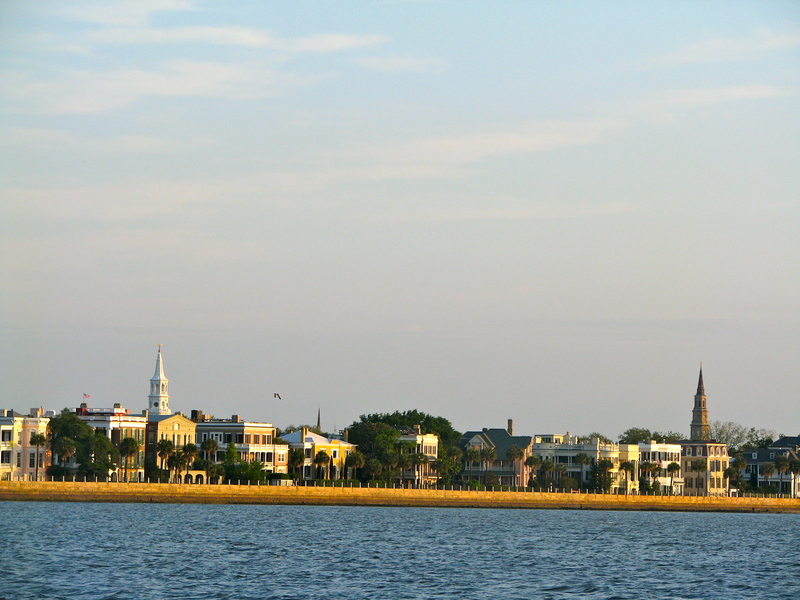 Manteo, NC, is a very historic and wonderful cruising stop. We highly recommend visiting here. 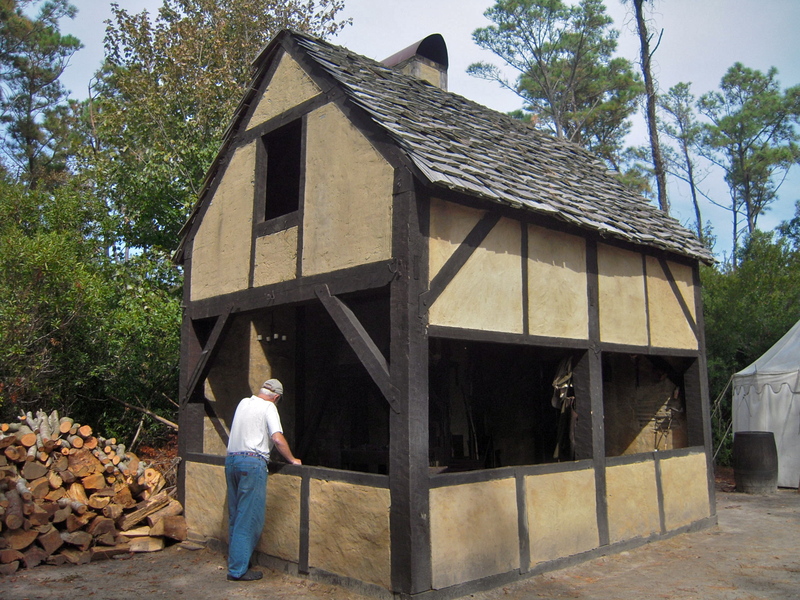 It is the Site of the first English Colony in North America, known today as the “Lost Colony.” Manteo is the home port of Elizabeth II, a reproduction of the ship that brought those 117 colonists to the region in 1587, including John White, his daughter, Eleanor Dare, her husband Ananias Dare, and their daughter, Virginia. The Roanoak Island Festival Park and Roanoak Adventure Museum includes a reproduction of the English Settlement and Indian Village, with crafts and demonstrations depicting life in a pre-colonial village. The Plantation does a particularly good job of honoring the importance and contributions of the local Croatan Indian peoples. 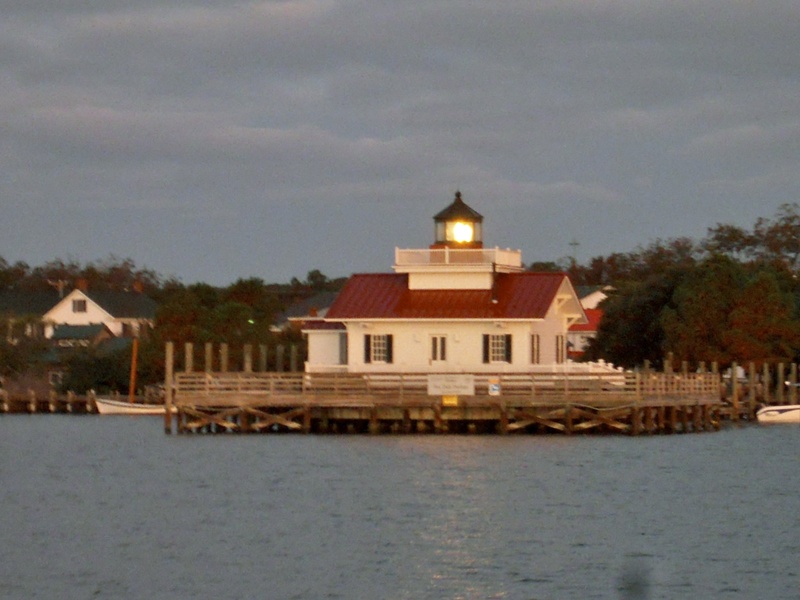 Manteo is the home of the Roanoak Marshes Lighthouse, and a small boat-building museum. There is a very nice marina, many shoppes and restaurants. Departing from Manteo, travel north and turn west immediately north of Roanoak Island. Proceed to the intersection of Croatan Sound, and turn north to the Albemarle. Set your course to either Coinjock, VA, or Elizabeth City, NC (46 StM). This entry was posted in North Carolina on 2013/06/16 by gilwellbear. In this region, a boat that drafts five feet will not have significant water depth problems on the A-ICW between Florida and Myrtle Beach, South Carolina. As with all waterways, the captain must maintain a careful visual lookout. Careful watch-keeping and disciplined concentration on the boat and the waterway is important in these waters. The often narrow channels are not the place to manage email, monitor the performance trends of personal investments, or handle business matters by cellphone. 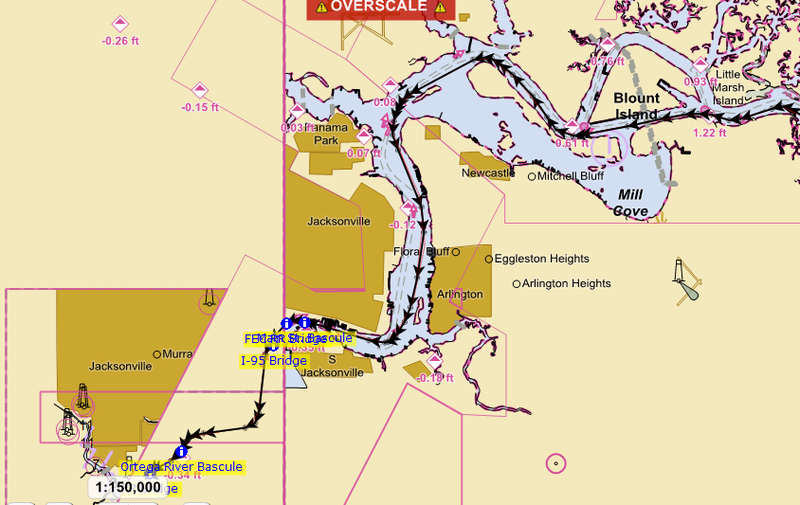 We frequently read posts from boaters who have “gone aground” while in mid-channel, and while on or closely near following the charted ICW “magenta line.” No matter where you might be on the ICW, do not assume the magenta line correctly portrays the best route or the deepest water. The charted “magenta line” is at best only a guide to the general direction of the recommended route. It is a good guide, but it is not perfect and is not suitable for piloting a boat. As the waterway changes, markers are added, relocated and removed. Printed charts cannot and do not keep up with local changes to the actual waterway route. Even the most current version of a chart can be years out-of-date. It is therefore essential for helmsmen to maintain a careful watch. The wise captain will also monitor daily US Coast Guard “Marine Safety and Information Broadcasts” for up-to-date information on missing or off-station markers and other hazards, but the general “rule” is, markers in the water always take precedence over charts. Sanctuary has traveled offshore upon occasion. Northbound, an easy outside run for slow trawlers is from St. Simons Island to Doboy Sound. A long day in a trawler is from the crossroads of the ICW and the St. John River in Jacksonville, FL, to the Duplin River on Doboy Sound, GA. A go-fast boat could easily run from Jacksonville or St. Simons Island to Tybee Roads (Savannah River). However, qualitatively, every outside run looks like any/every other outside run. If your interest is in quickly getting to a destination, or if you have transited the ICW many times and are trying to stay ahead of the approach of unfavorable weather, then an offshore run might be a fine choice. But if you’re touring, and you want to see and learn about the countryside, or your interest is in the journey, that objective will be best accomplished by running inside on the ICW. Seasonal hours-of-daylight can affect travel options in this region. In the spring, morning twilight will start at 06h00, and sundown will be around 19h30. In the late fall, after the time changes back to standard time, morning twilight will start at 07h00, and sundown will be around 17h00. Travel in the fall will necessarily be foreshortened. Do not travel these waters at night unless you are very, very familiar with the area. We aboard Sanctuary are trawler people – a slow trawler at that – so we plan our travels around an average speed-over-ground (SOG) of 8.2 StM/hr. For us, the optimum timing choice for a Northbound departure from Fernandina Beach, FL, is when the tide is rising and the immediate next high tide will occur around 07h00 at Fernandina Beach. With this timing, we do sometimes encounter foul currents, but we don’t worry about unfavorable water depths. Northbound, the high tide will be approximately 42 minutes later each day, so as we proceed north through the Low Country, we will have high water during the mid-day hours of our planned travel. Fair and foul currents alternate throughout the day regardless. When low tides occur at mid-day, that can result in concerns over shallow water, shortened travel days and anxiety along the way. 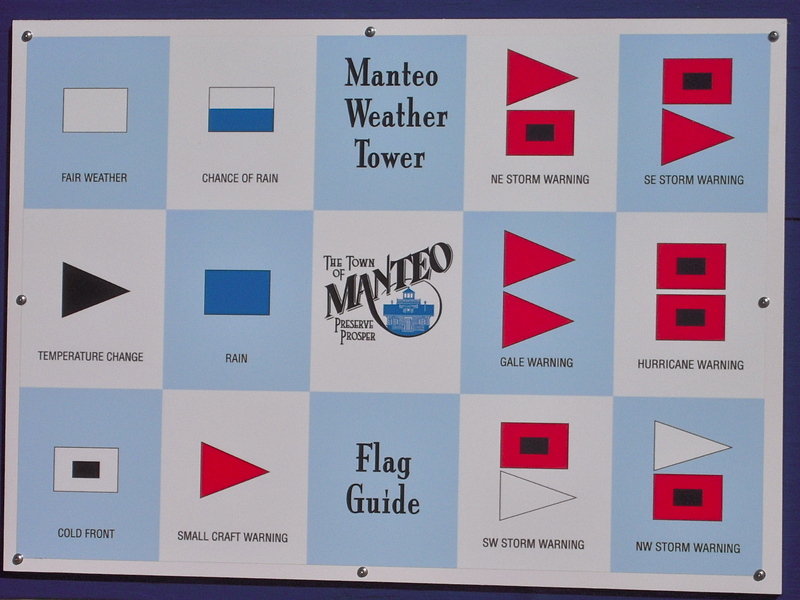 For the most up-to-date information on the known areas of concern (hazards) along the route from Fernandina Beach, FL, to Myrtle Beach, SC, there are three resources which we suggest all cruisers should utilize. We recommend a tablet PC with an app that allows you to view Active Captain data (http://www.activecaptain.com) in real time. One popular solution for that is an iPad with Garmin’s Bluechart Mobile app or the iNavX app. As you move along, hazard markers will show you information on areas-of-concern in real time. For daily navigation, route planning and personal preparation, I recommend consulting Claiborne Young’s Salty Southeast Cruiser’s Net (SSECN) web site (http://www.cruisersnet.net) and the Skipper Bob/Waterway Guide web site (http://www.waterwayguide.com). There is a lot of overlap between these web-based resources, but there are often pearls on one that are not – at that time – available on the others, so I recommend referring to all three. For charts, we use and prefer the Maptech paper chartkit books. This area is covered by the Regions for “Florida, East Coast and Keys,” and “Norfolk to Florida.” Even if you have electronic charts aboard, we recommend having paper charts on hand, too. Relative to fixed dayboards and markers on the A-ICW, the “rule” is to stay away from them; that is, do not cut too close to them. “Take your half out of the middle.” These markers generally mark areas of shoal water, and some of them are actually dry at low tide. Do not get too close to them. Floating markers generally mark the edge of safe water, so it’s OK to get closer to them, but be cautious. The A-ICW marking system is standardized; red markers are always to the inland side of the waterway, and green markers are always on the seaward side. Therefore, Northbound, ICW red markers will be on your left. At inlets and on bigger rivers, especially where there is commercial traffic, this scheme often reverts to the COLREGS system (red-right-returning), so make sure you can identify the yellow reflective A-ICW stickers on markers in harbor and river areas, and be alert to the arrangement of lateral markers. If you confuse the COLREGS scheme with the A-ICW scheme, that can lead to a meeting of the close and personal nature with a local Tow BoatUS or SeaTow captain. If going offshore, plan offshore route choices very carefully. The “rule” for crossing the Gulf Stream to the Bahamas is, no wind component from the north. Running off the Georgia and South Carolina coast, the rule is, no wind component from the south. Most of the coastal offshore run is in a northeasterly-southwesterly direction. Any Southerly wind component will combine with onshore ocean swells to produce beam seas along the shallow offshore shelf waters. These seas will be short period and choppy. Also, make sure your route clears the many shoal areas of the offshore shelf. In some places, you’ll have to be 10 miles offshore to be clear of shoal waters. In nasty seas, near-shore water is more calm than farther out, but stay very alert and look well ahead (several miles) to be sure you’ll have safe water in your planned route when you get there. Avoid finding yourself deep into a blind pocket (think: “box canyon”) in a shoal. Doboy Sound and Sapelo Sound inlets are both fine for use by recreational boats. They are routinely used by commercial shrimpers and local fishermen. They are both well marked, although at Sapelo, the markers are quite widely spaced. If you use Sapelo Inlet, find and identify the markers and make sure to honor them. There is a significant onshore/offshore current at all SE inlets due to the high tidal ranges in the region. Tidal currents probably won’t affect a go-fast boat much, but it’s a factor for trawlers. The 40 ~ 50 miles north of Charleston again requires concentration and disciplined watch-keeping. The A-ICW from Charleston Harbor to Isle of Palms, SC, is very shallow at low tide. A good strategy for us is to stay just north of Mt. Pleasant, like Isle of Palms, or to anchor at Inlet Creek or Dewees Creek, and then depart northbound at or just after an early morning (06h00) low tide. If you do that, you’ll have a fair current all the way to Myrtle Beach. Even with a fair current, we can’t make it from Isle of Palms to Myrtle Beach in one day, but we can easily make it from Isle of Palms to Bucksport or Osprey Marina. Over the years, we aboard Sanctuary have developed some preferences for places to overnight. Much of what we do in this area depends on the specific timing or our transit and the local current and forecast weather. We very much like Fernandina Beach, which is an historic and welcoming city that has easy access from the marina/mooring field and several nice restaurants. Between Fernandina and Savannah, we anchor along the ICW, often at the Frederica River at Fort Frederica (MM 665.7), the Duplin River (MM 649.3) or at Walburg Creek (MM 619.0). There are excellent marina choices in the Jekyll Island/Brunswick area. There is an excellent source of diesel fuel at Ocean Petroleum on the east shore of the East River, past the state seaport and the shrimp fleeting area. We like Thunderbolt, GA, where there are several marina choices, a great local marine chandlery (River Marine Supply), and a couple of OK restaurants. From Thunderbolt, there is reasonably convenient Savannah city bus service for access to downtown Savannah. In downtown Savannah, there is a good city dock facility right along the riverwalk. It is in a mostly-honored no-wake zone, and there is tug, barge and commercial ship traffic in that channel. The tidal range is 9 feet, +/-, and at low tide, the Admiral feels like she’s in a “fishbowl,” so she prefers T’bolt to Savannah. Above Thunderbolt, depending on timing, we sometimes anchor at the Cooper River (MM 568.8), immediately above Ramshorn Creek. Or, there are several marinas in Calibogue Sound at Hilton Head Island. We very much enjoy Beaufort, SC. Port Royal Landing Marina is a friendly and welcoming full-service marina. A mile north, holding is good in the anchorage (MM 536.3) off the Beaufort Downtown City Docks. Some cruising guides highlight the anchorage in Factory Creek, north of the Lady’s Island Swing Bridge, but it’s lined with businesses and homes, and even for our 36′ boat, I find it to be too narrow for my personal comfort. 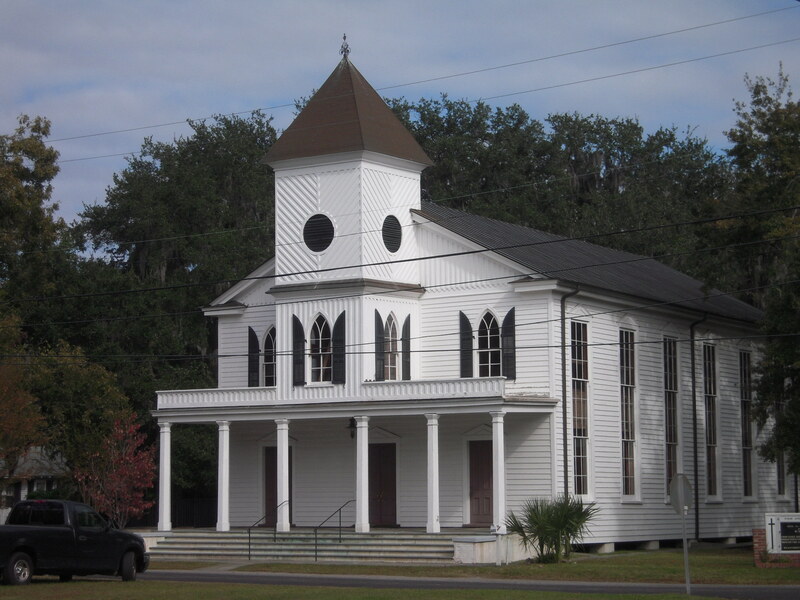 The town of Beaufort is an antebellum architecture delight. There is a carriage tour that is well worth the time, and there are several fair-to-good restaurant choices. Currents in the Beaufort River are significant, reaching 3 knots at max ebb and flood. I do not like the docking arrangements at the Downtown Marina docks, but the staff is very familiar with conditions there, and is able to help if you’re willing to listen to them. Nevertheless, we prefer to anchor here. We occasionally anchor at Church Creek (MM 488.2), below Charleston. We love Charleston. If we’re just passing through the area, we stay at St. Johns Yacht Harbor, immediately south of Elliott Cut. St. John is a welcoming and friendly full-service marina. In “downtown” Charleston (the “battery” area), we prefer the Charleston Maritime Center to all other local marinas, although the marina is exposed to harbor sea conditions and wakes from passing boats. CMC is a welcoming and friendly full service marina. It is located on the north shore of the Charleston battery, adjacent to the docks of the commercial seaport. It is within easy walking access to the city, a large Harris-Teeter grocery store, the state aquarium, the National Park Service tour to Ft. Sumter, and great downtown restaurants. We absolutely avoid the Charleston City Marina, located on the south shore of the Charleston battery near the Coast Guard Station. At that location, there is a generally ignored no-wake zone. The marina fairways are narrow and tight. River currents are very strong. We think that location is a recipe made for an insurance claim. Finally, depending on our circumstances, we sometimes anchor at Inlet Creek (MM 461.0) or Dewees Creek (MM 454.9) in the A-ICW above Charleston. Many cruisers consider Georgetown a must-stop. The anchorage is crowded. The marina choices are adequate but not inspiring. It’s a “touristy” town, with couple of OK restaurants. We do recommend it, at least once. We anchor at Butler Island (MM 396.0) or Bull Creek (MM 381.5), above Georgetown. We quite like, and often stay at, Bucksport Plantation. Osprey Marina often offers excellent fuel prices. Barefoot Landing is an enjoyable stop, at the foot of an outlet mall. There is often a great stage show at “America,” in the mall. There are several marina options in the basin behind Governor’s Light at N. Myrtle Beach, including Myrtle Beach Yacht Club, where good fuel prices are the rule. There are lots of options in this region for the cruising boater! This entry was posted in Georgia and South Carolina on 2013/05/16 by gilwellbear.